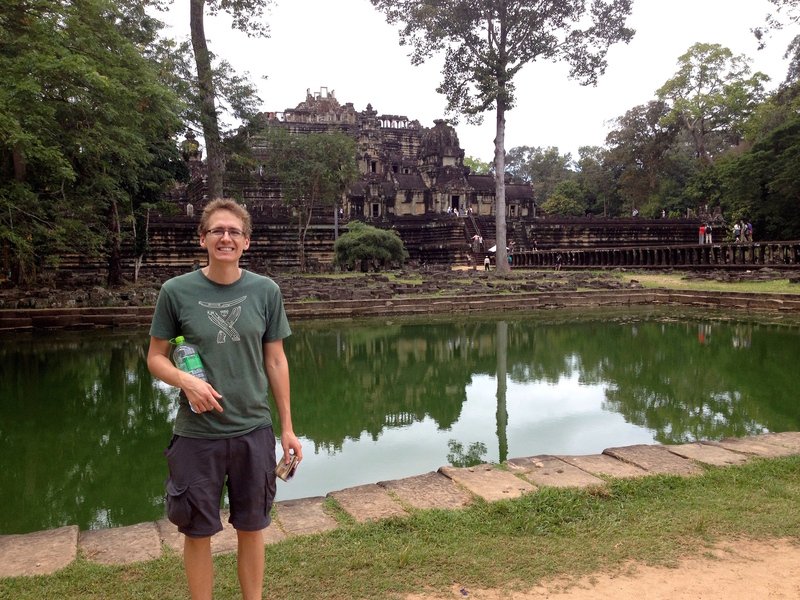 Finally, the epic finale to my 3-part series about our trip to Cambodia – our Guide to Angkor Wat. This one’s going to be heavy on the photos and light on the words, perfect for coming off of the Christmas food hangover, right? I always appreciate a bit of light reading when I’m trying to work my way out of a dinner roll coma. I already wrote about our time in Phnom Penh, and posted a little bit about things we did in and around Siem Reap, and this week I’m posting about the time we spent at Angkor Wat. 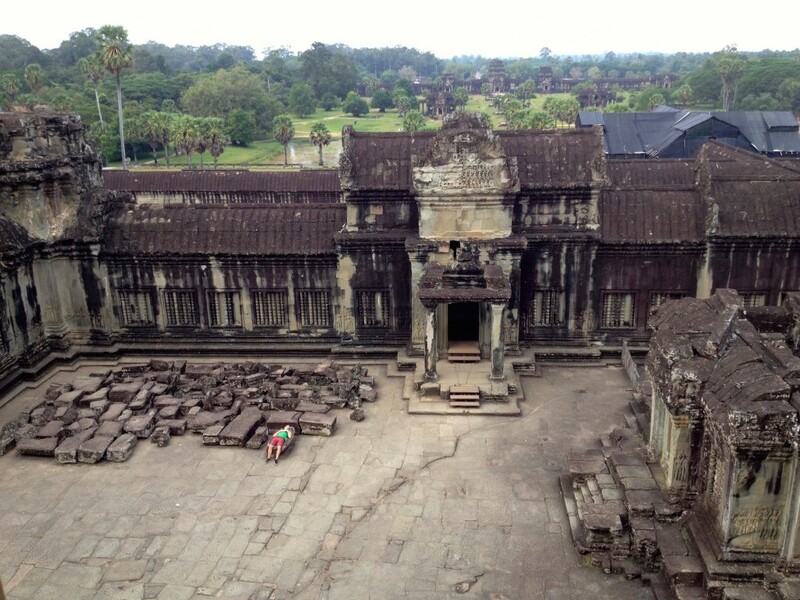 Angkor Wat, located just north of Siem Reap in Cambodia, is the largest religious monument in the world. It was first a Hundu Complex, later turned to Buddhist complex, and has an incredibly rich history full of occupations, wars, devastation, and restoration. Angkor Wat is probably the biggest draw for tourists who visit Cambodia; it’s so important, in fact, that it appears on the Cambodian flag! Ok let me embarrass myself here for a moment. 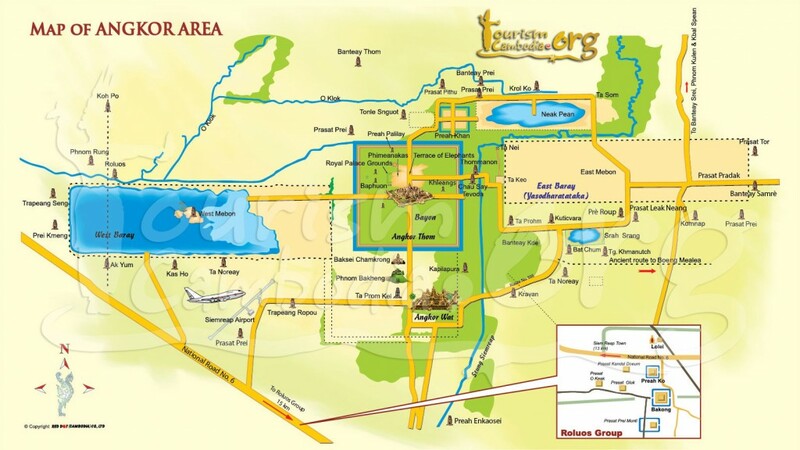 Before researching Angkor Wat, I didn’t realize that “Angkor” refers to the larger area north of Siem Reap that encompasses MANY temples, not just Angkor Wat. (Reminder: Wat means Temple.) 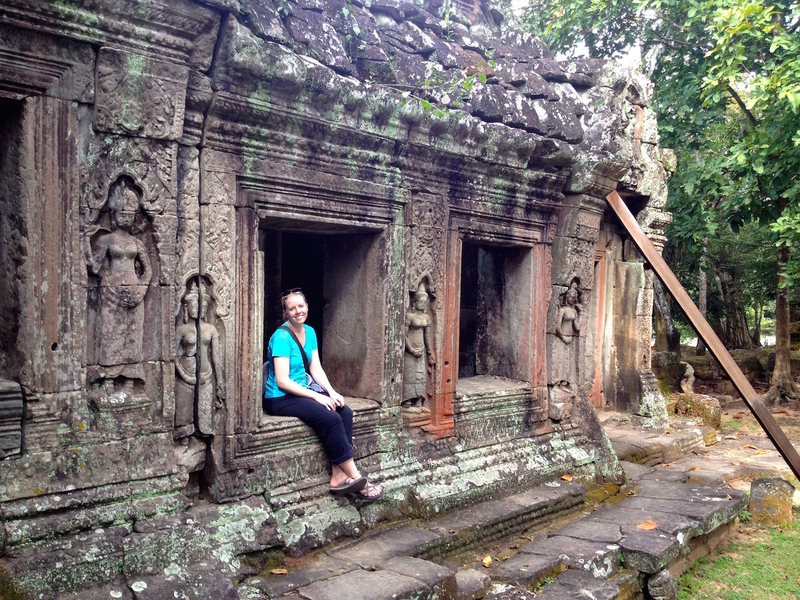 Based on our visit, I was under the impression that there were about a gazillion temples in the Angkor Complex. (Yes, a gazillion. That’s a lot of temples.) I found out on the interwebs, though, that there are merely 1,000+ temples – still a lot, but a bit lower than I estimated. 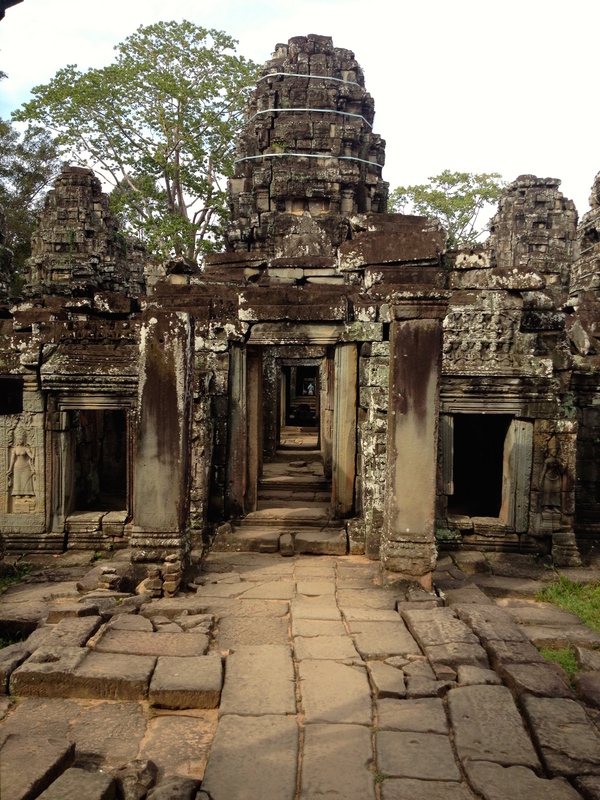 Nearly 2 million people visit the temples of the Angkor Complex each year. During peak season (Nov-Feb), that means huge crowds. 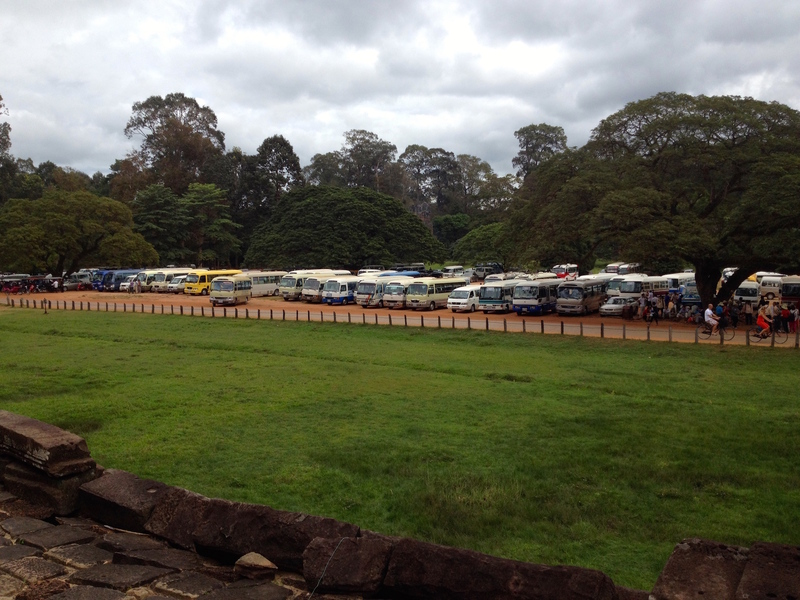 For proof, check out all these tour busses! PHEW. SO MANY TOUR BUSSES NOOOOOOOOOOOOOOO!!!! 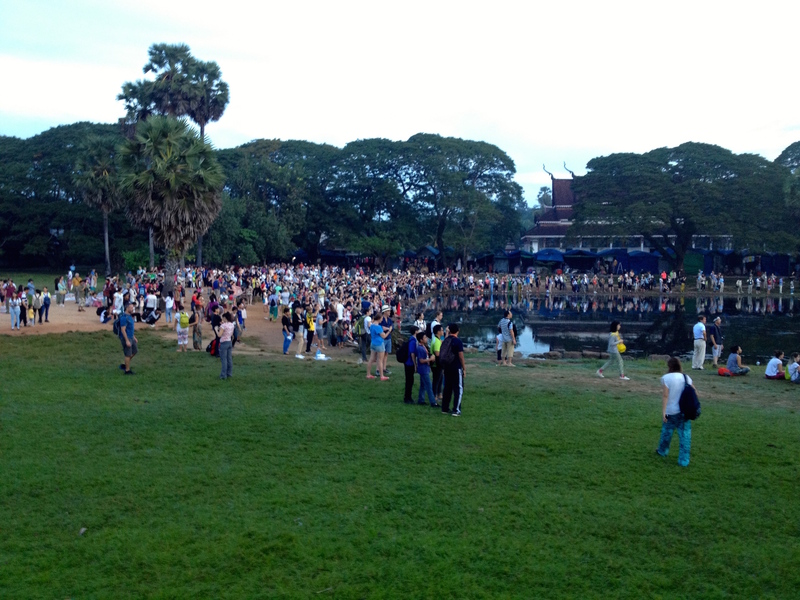 Because of the crowds and because of the hot humid weather, we recommend leaving your hotel around 6am for Angkor, returning back to your hotel before lunch. You’ll beat a lot of the crowds, and you can spend your afternoon lounging by your hotel pool! Trust us, the temples are MUCH more enjoyable when some random woman isn’t knocking you in the head with her umbrella. Have you heard of snow blindness? (Official medical term: photokeratitis.) If you haven’t heard of it, it’s blindness caused by too much of a good thing: sunlight. It can happen to people who don’t have eye protection in snowy areas where light reflects so strongly off of the snow. I’d like to present the world with a new, similar disease: temple blindness. (Official medical term: phototempleatitis.) Temple blindness is caused when you visit too many temples in a short period of time. Everything starts to look the same, you stop appreciating unique features of each temple, a general crankiness may set in and you might even begin craving chocolate. It’s a dire situation, people. 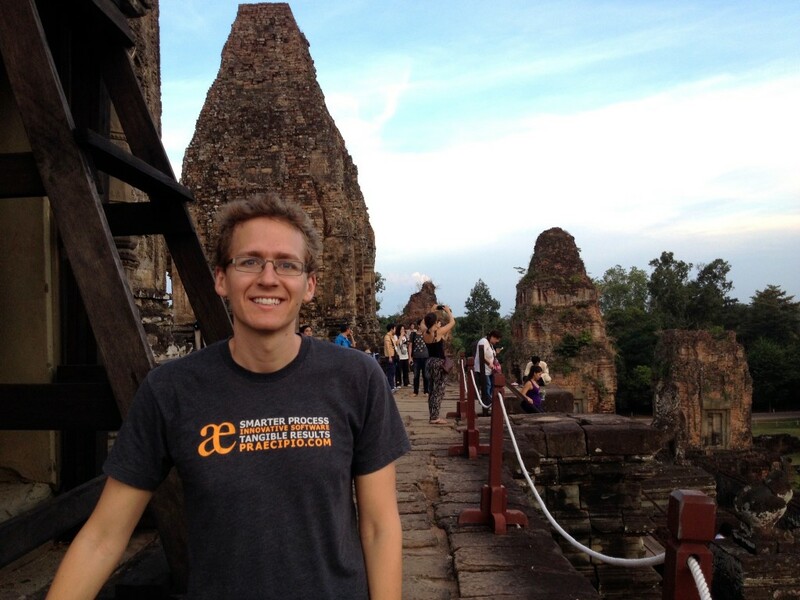 Temple Blindness in full force – check out the look on Kevin’s face! Luckily, this can be easily avoided. 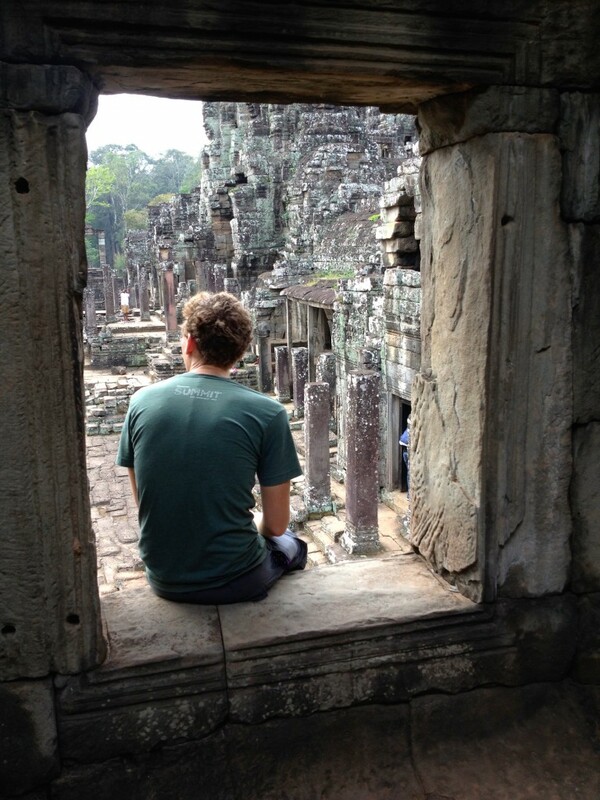 We recommend spending just half-days at the temples, visiting no more than 4 spots per day. 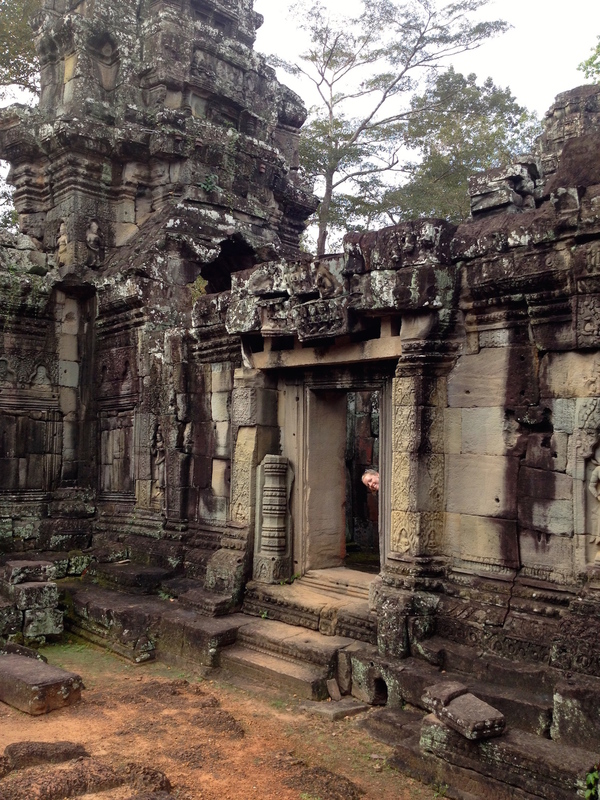 As of December 2014, it costs $20 for a 1-day pass to Angkor and $40 for a 3-day pass. 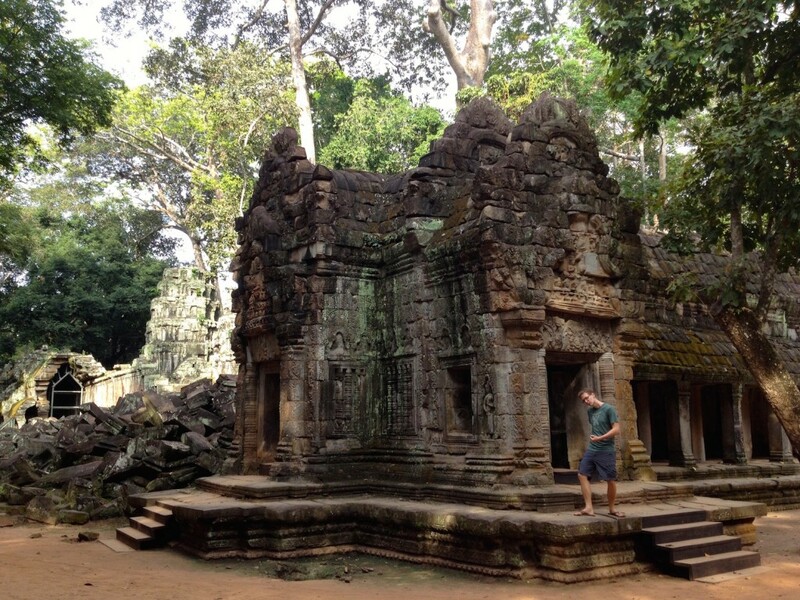 I wouldn’t wish a whirlwind marathon 1-day tour of the Angkor temples on my worst enemy – it would be absurd to try to cover enough ground to feel like you’ve seen enough to make your trip to Cambodia worth it. So you should definitely spring for the 3-day pass. 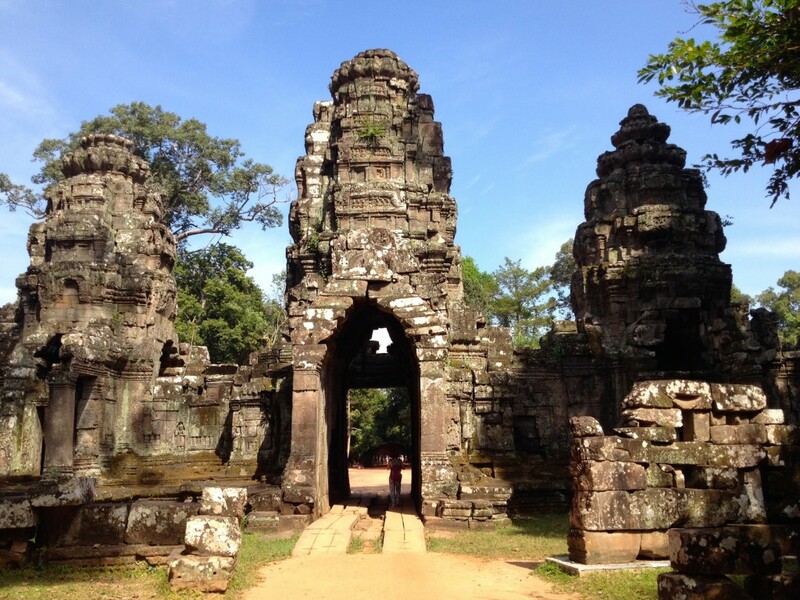 PRO TIP: If you purchase your pass after 5pm, you can enter Angkor on “Day 0″ to view sunset. When you leave after sunset, you still have all 3 days left on your pass! 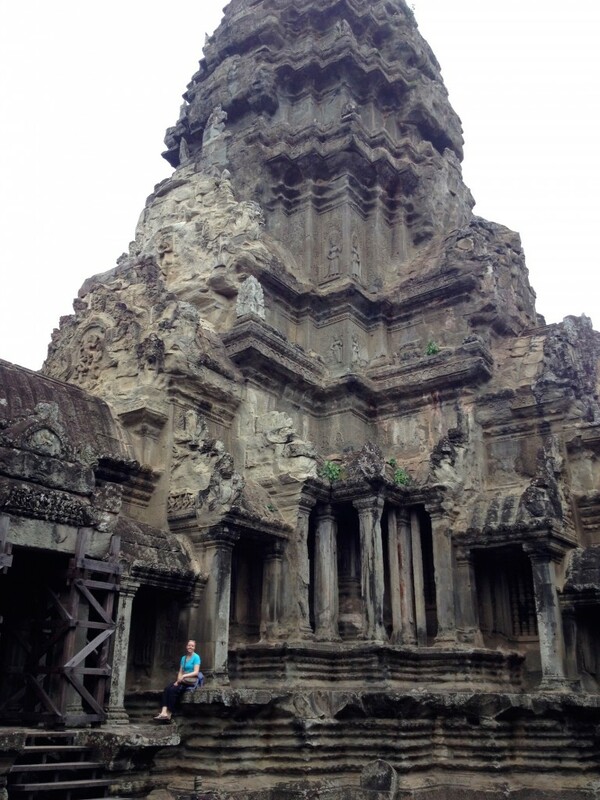 With over 1,000 temples to choose from, it’s absolutely insane to try to see everything. Decide what you want to see: are you into intricate carvings? 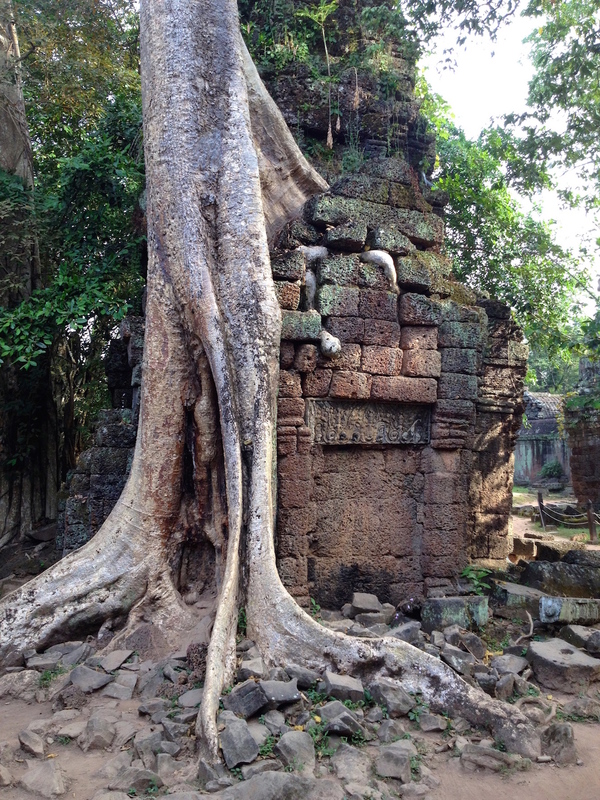 Do you prefer temples that are being eaten up by nature? Or are you more interested in the restoration projects? Do your research before visiting, and create your own customized itinerary. On the other hand, you could just show up and let your Tuk Tuk driver take you on their standard tour. They tend to run two types of tours – a “big loop” or “small loop”. We recommend the “big loop” on the first day to get a taste for the size of the grounds (you may need to cut a few temples from the list if you want to keep things down to a half day!). If you’re into cycling, rent a bicycle and do the “small loop” yourself on Day 2. Then if you have anything left you want to see, book a tuk tuk driver for Day 3. Easy peezy. 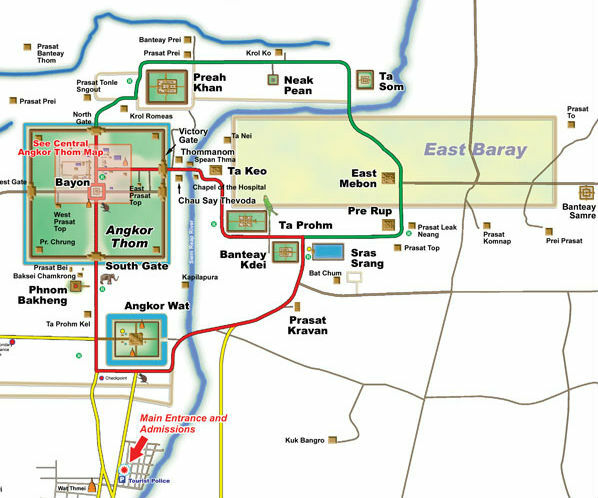 The Big Loop (green) and Small Loop (red) at Angkor. 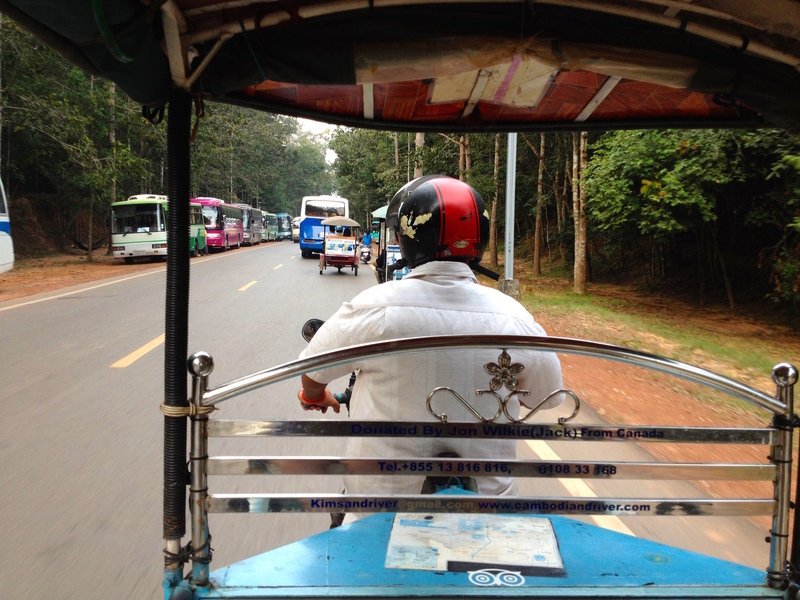 Tuk Tuks in Cambodia Are Cheap and Fun! This is Mr. Kim, our Tuk Tuk Driver for 2 Days. 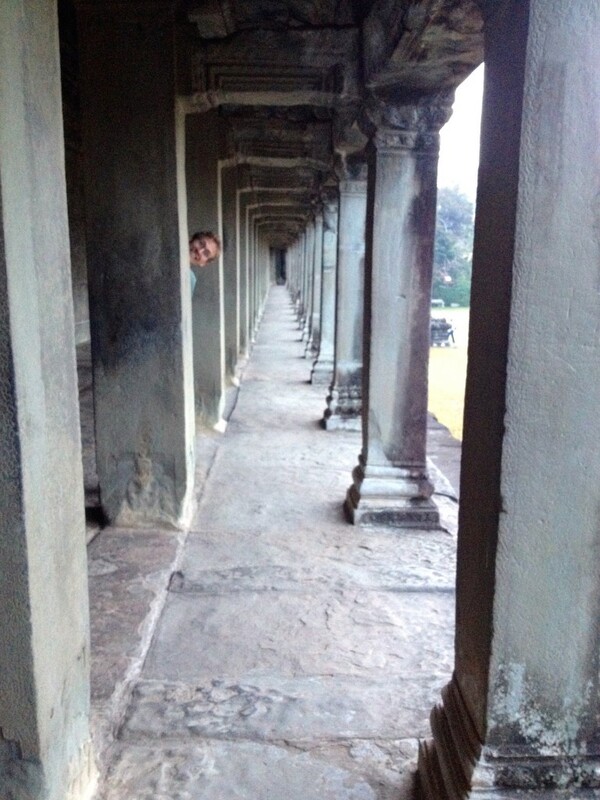 At the top of Angkor Wat! 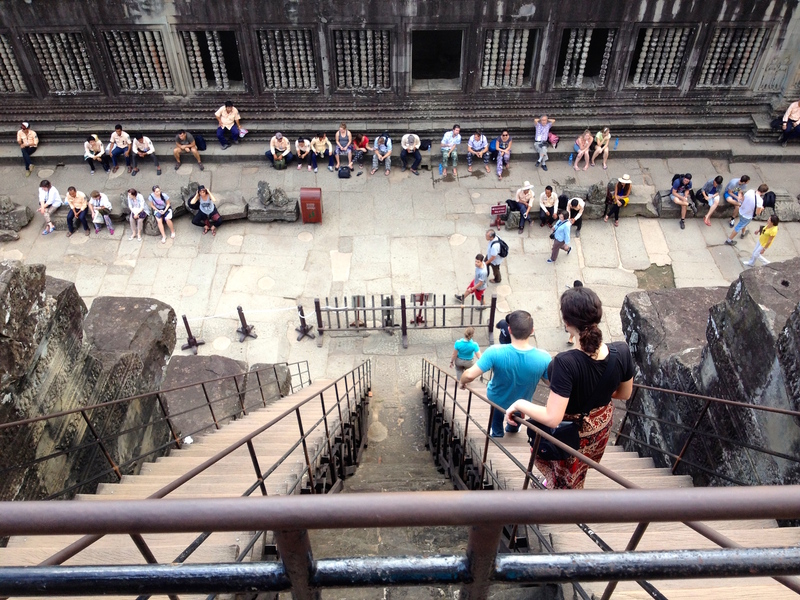 The stairs to climb to the top of Angkor Wat. They open at 7:30am, and close sometime in the afternoon. Worth the climb! 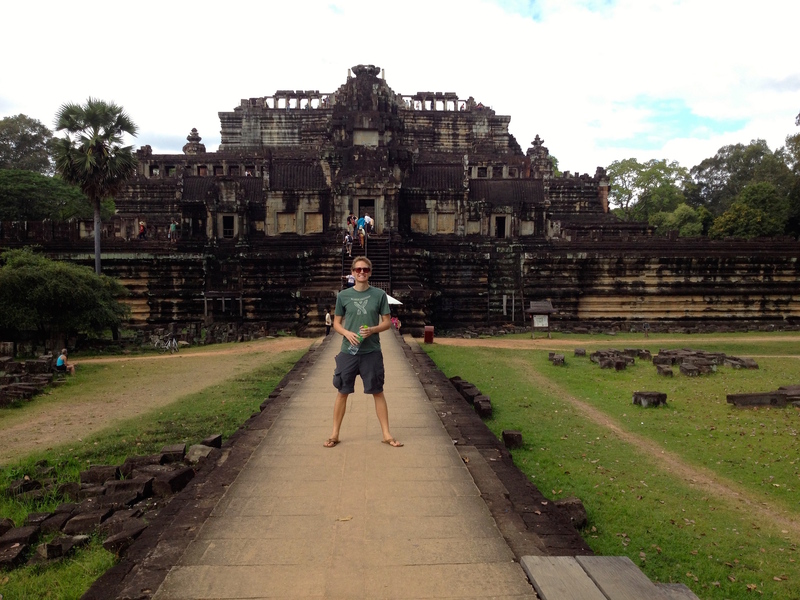 We visited Angkor Wat immediately after sunrise, and it was practically empty! 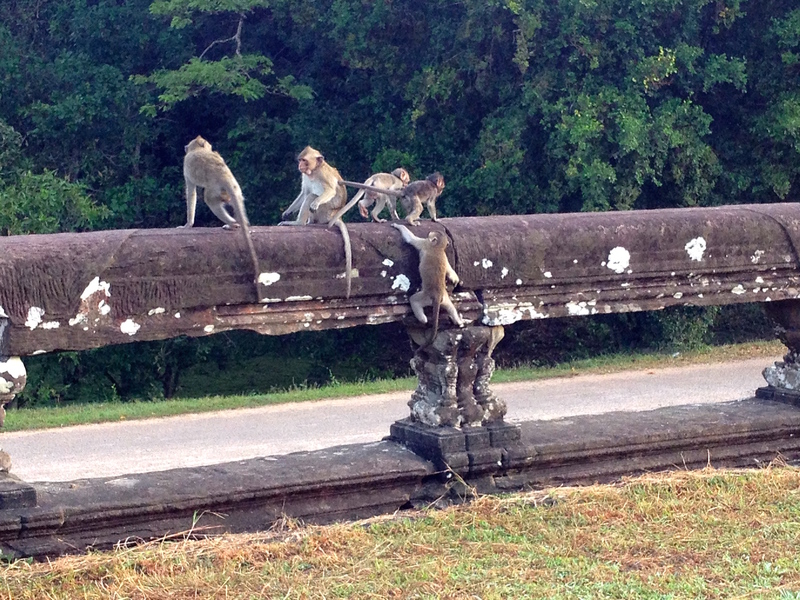 Monkies at Angkor Wat. Mr. Monkey is just picking at his wife monkey’s tushie. No big deal. 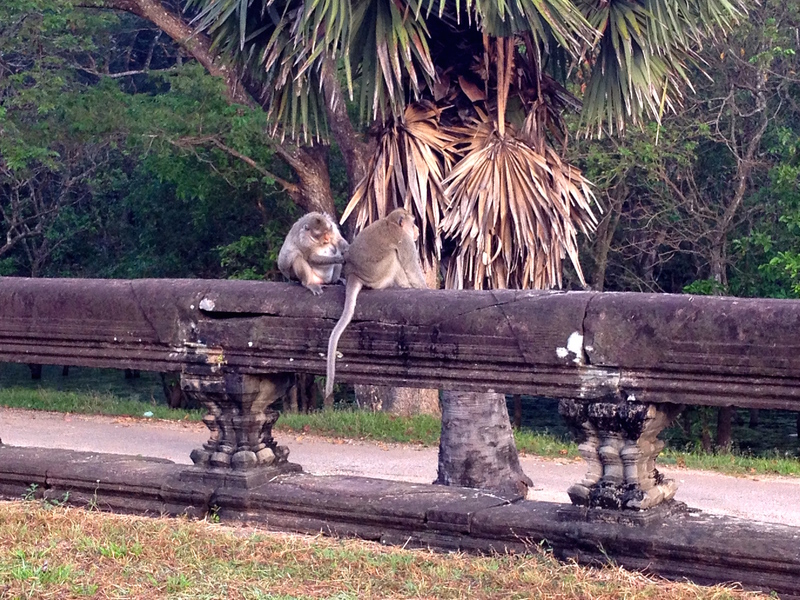 Monkies Playing at Angkor Wat. 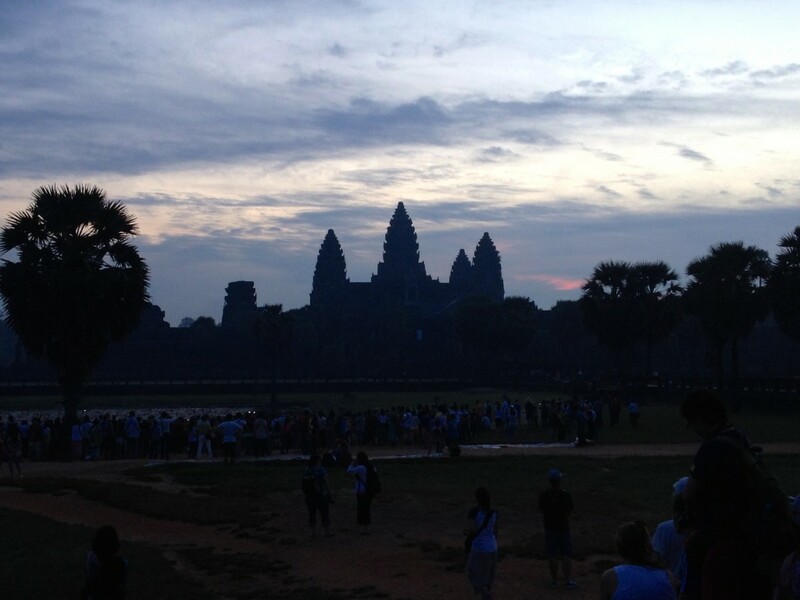 Many tourists who visit Angkor Wat choose to make the early morning pilgrimage to view the sun rising behind Angkor Wat. We did it, and thought it was great! The only bad thing? You need to leave your hotel by 5am. Because you have to arrive so early, it works best if you already have your Angkor Pass purchased. Beware: Sunrise is Ridiculously Crowded! PRO TIP: Be sure you stay at a hotel that will pack you a to-go breakfast! We stayed at the Villa Um Theara, and they were happy to have a to-go breakfast all ready for our 5am departure. 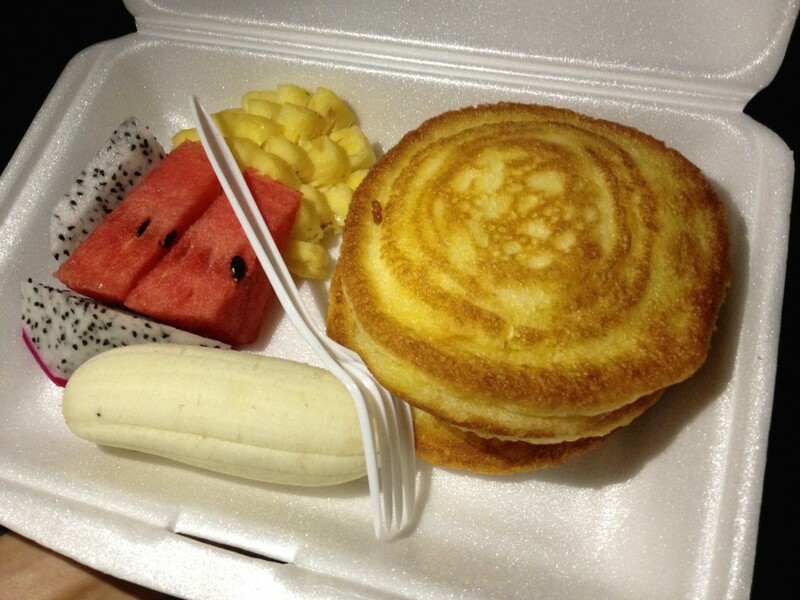 My To-Go Breakfast of Pancakes and Fruit! YUM. 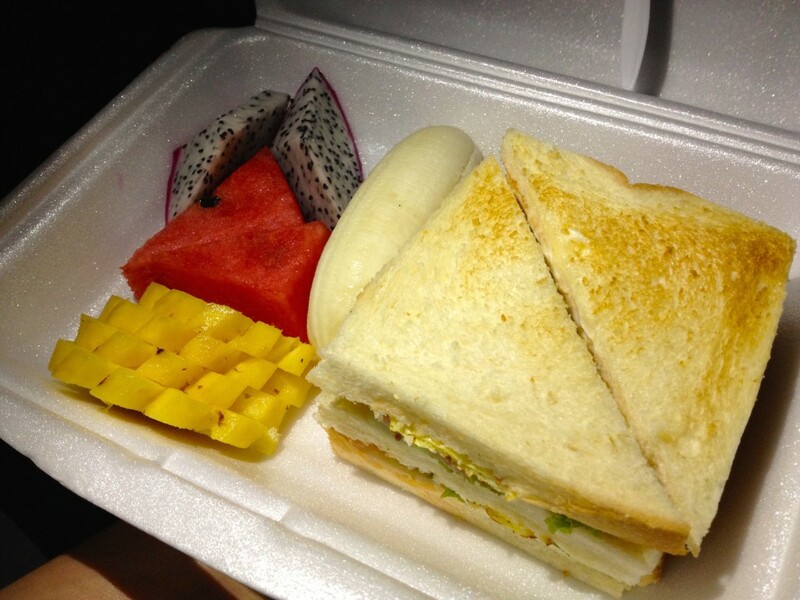 Word of warning – never order a sandwich in Southeast Asia. Kevin got the “Club Sandwich” for breakfast, and it was pureed meat with a ton of mayo on white bread. BOO. 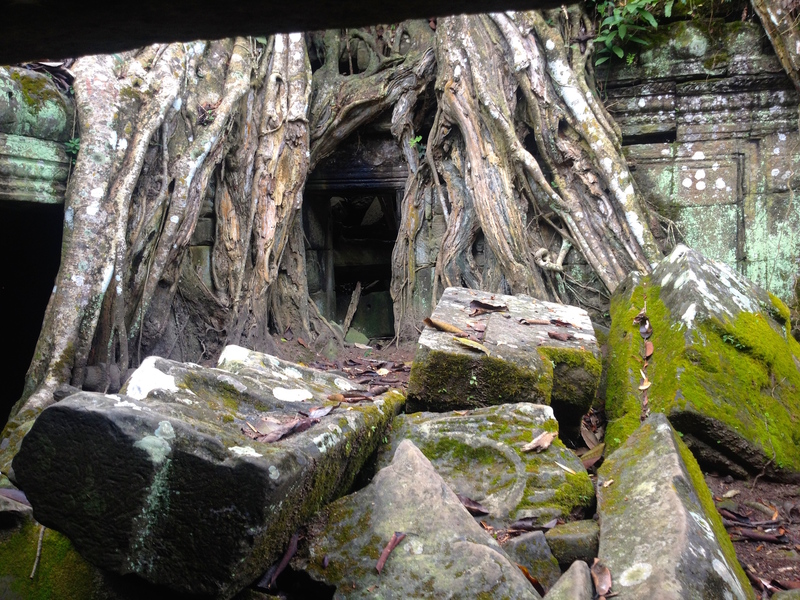 Ta Prohm is the temple where part of Tomb Raider was filmed. Here we are, in front of the tree that was shown in the movie! 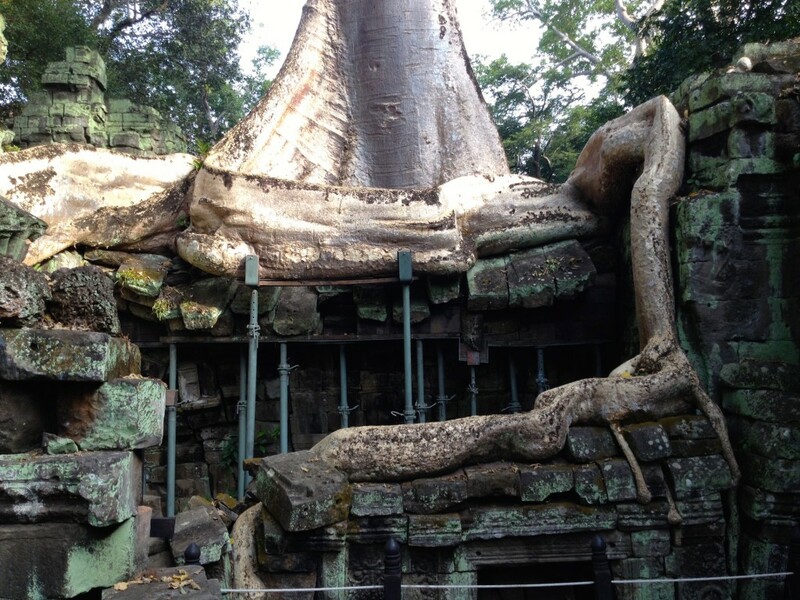 Ta Prohm. 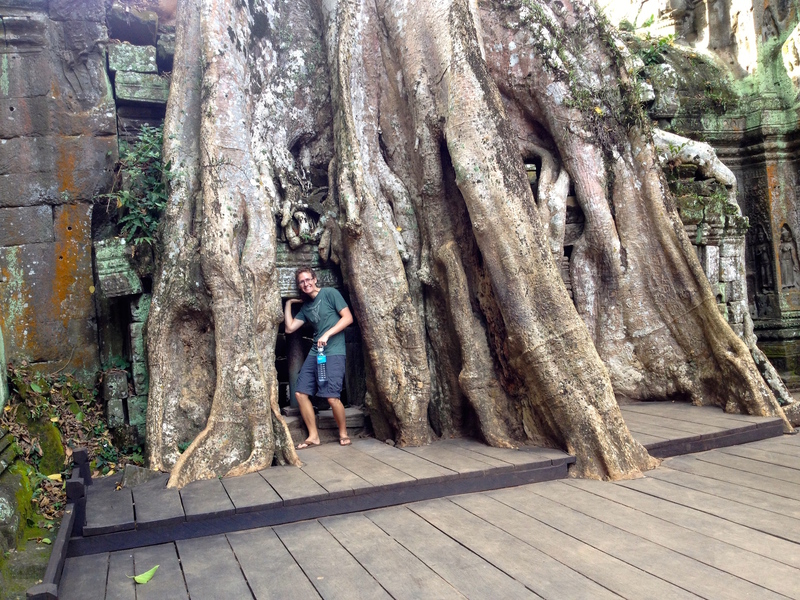 Those are some ginormous tree roots! 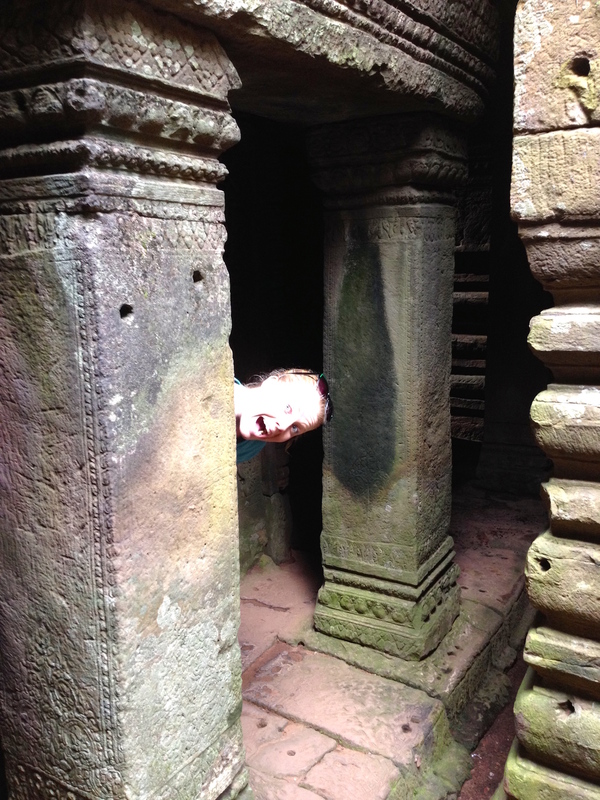 We loved Ta Prohm because nature is swallowing it ever so slowly. 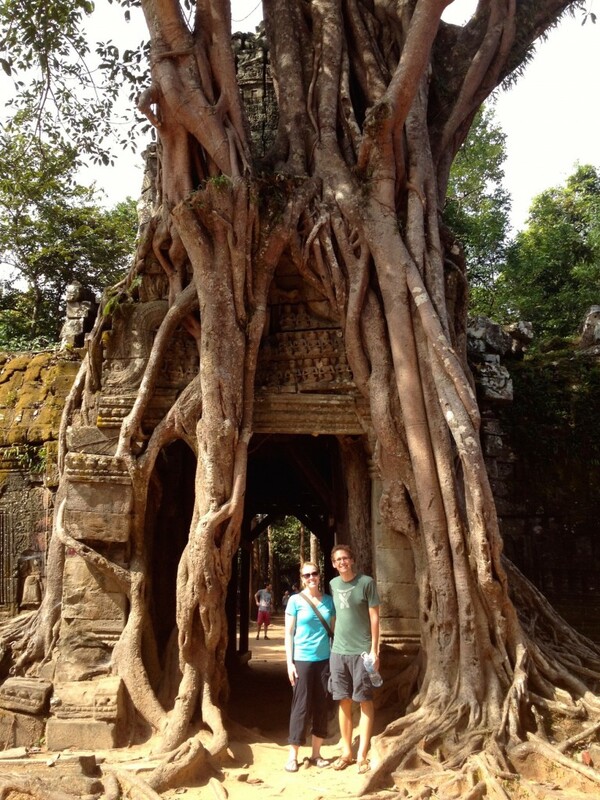 GIANT Tree Roots at Ta Prohm. 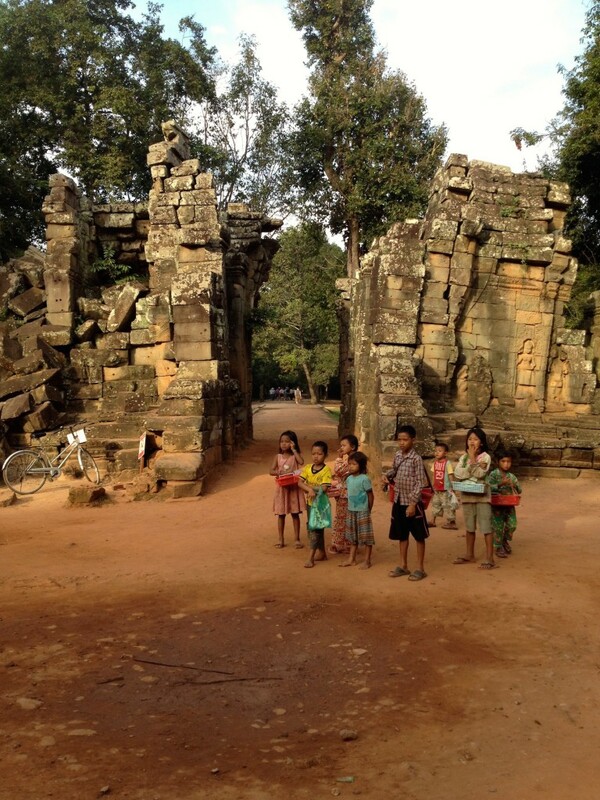 When we pulled up to Ta Prohm, the kids were out in full force to sell trinkets, souvenirs, and tour books. 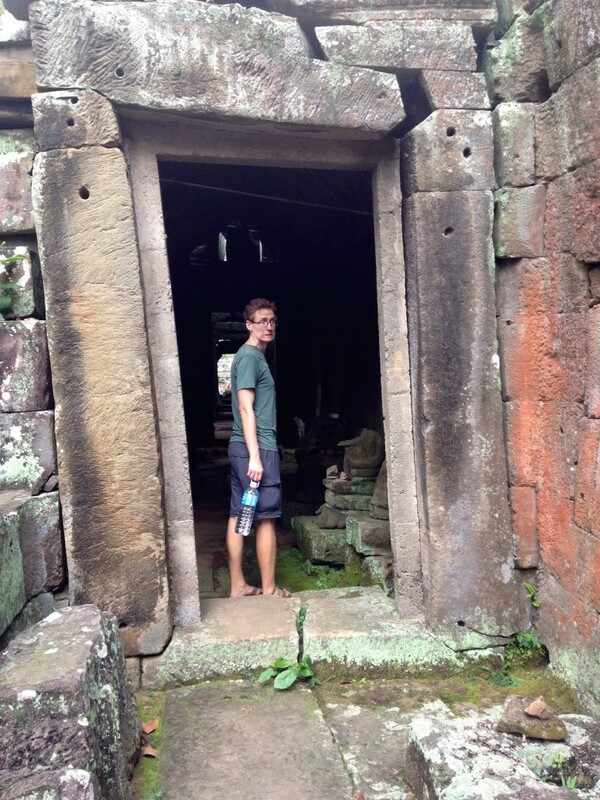 And here’s Kevin, holding up a doorway at Ta Prohm. 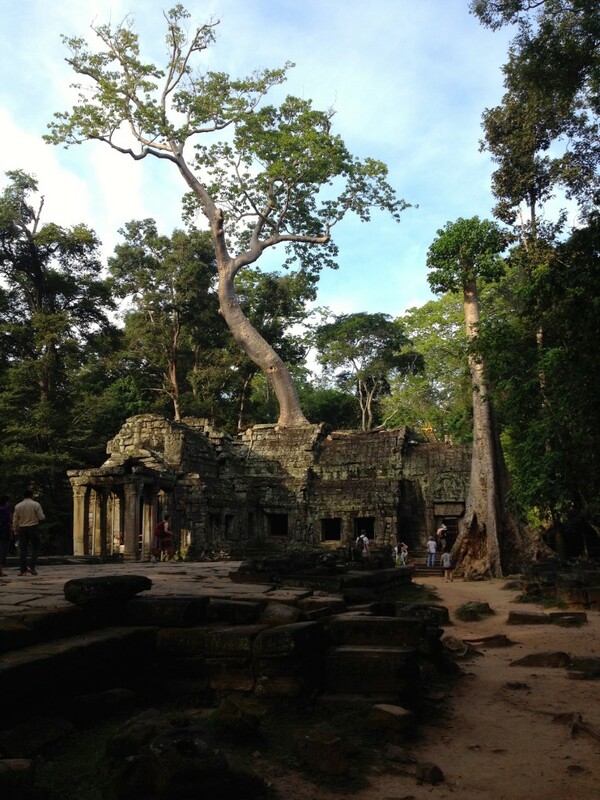 Exterior of Ta Prohm. 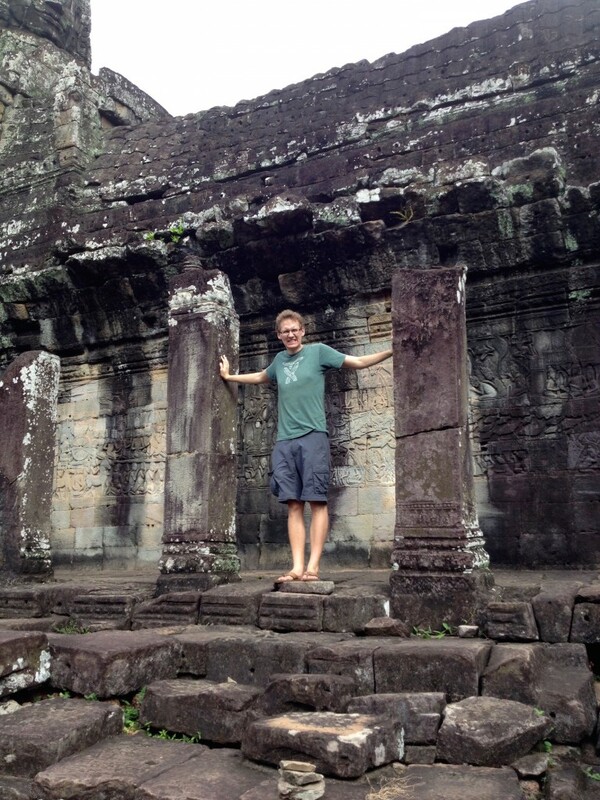 This is Kevin’s “Let’s Rock this Temple” move. Bantaey Kdei wasn’t really on our radar until our friends Liz and Chris recommended it. We were delighted when we arrived to find hardly any other people there. 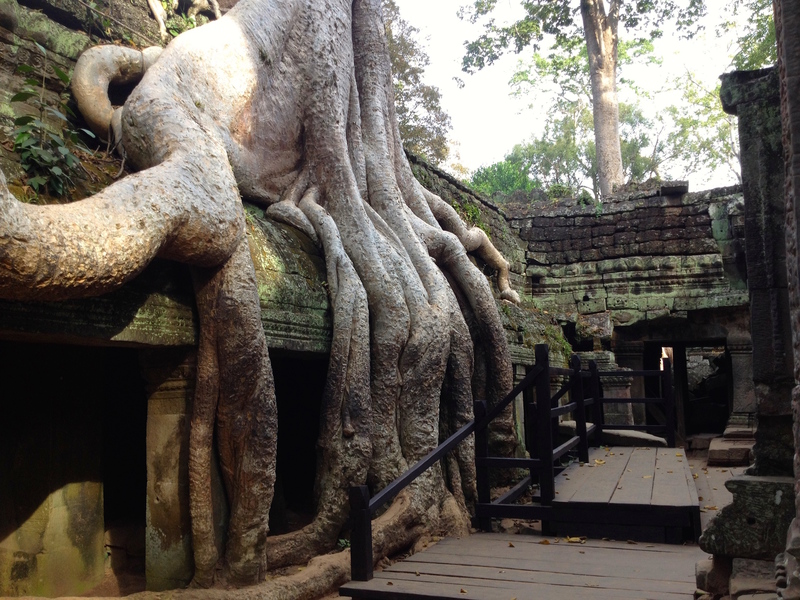 Like Ta Prohm, this temple has been heavily impacted by nature, which is one of the most fascinating things to look at, for us. We highly recommend this one to anyone else who visits! The front of Bantaey Kdei. See? No Crowds! Sidenote: would YOU feel comfortable walking under this archway?! The leaning walls of Bantaey Kdei. In previous decades, theft of pieces of the temples has been a huge problem. 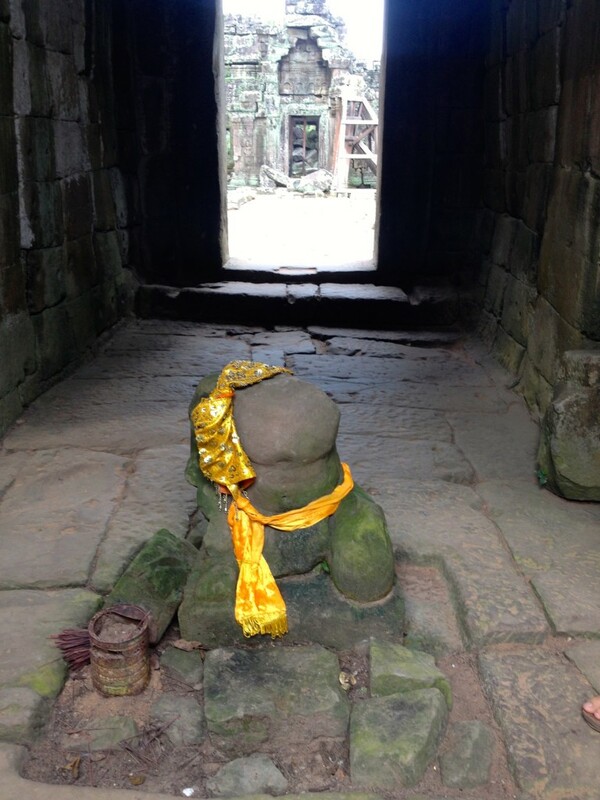 This statue at Bantaey Kdei is missing its head, possibly because someone took it! 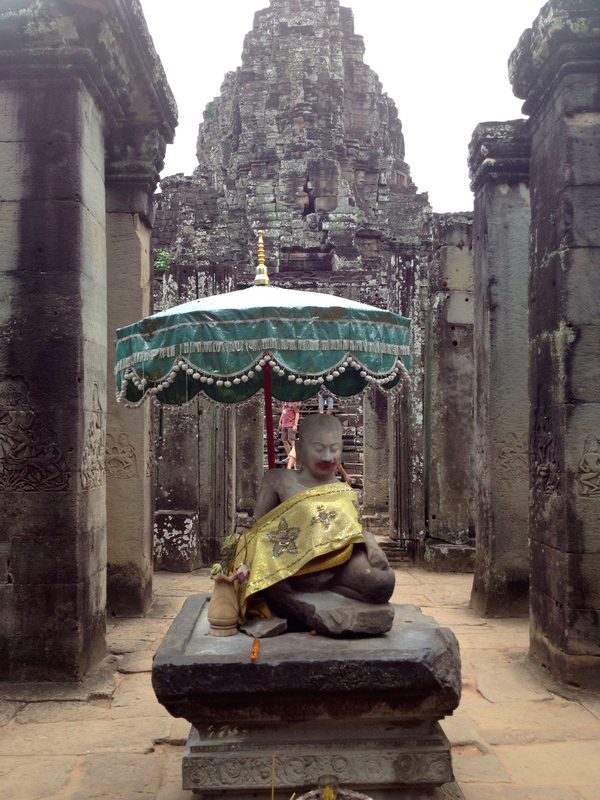 It’s actually fairly rare to see a fully intact statue anywhere at Angkor. Bantaey Kdei also has some really great stone carvings. Leaning doorway and walls at Bantaey Kdei. Ta Som is a pretty small temple compared to the rest of the ones we visited. 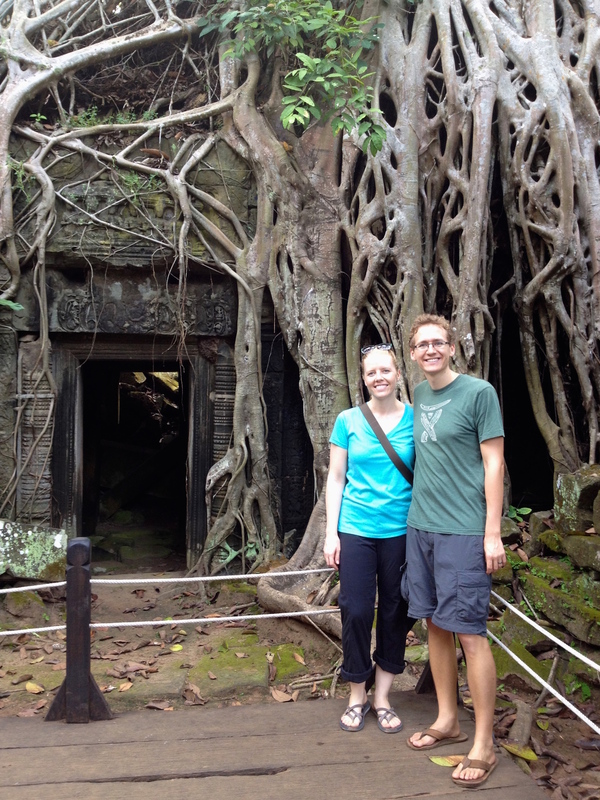 We stopped by mostly because of the archway at the far back of the Ta Som grounds is almost entirely swallowed up by a tree. This archway is easy to miss if you’re in a hurry, but worth the stop. 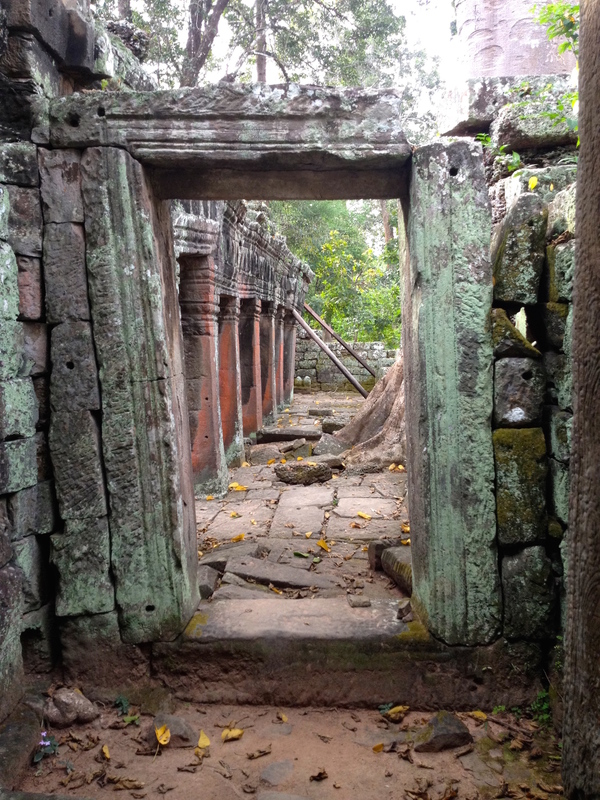 One of the bridges leading into Preah Khan. 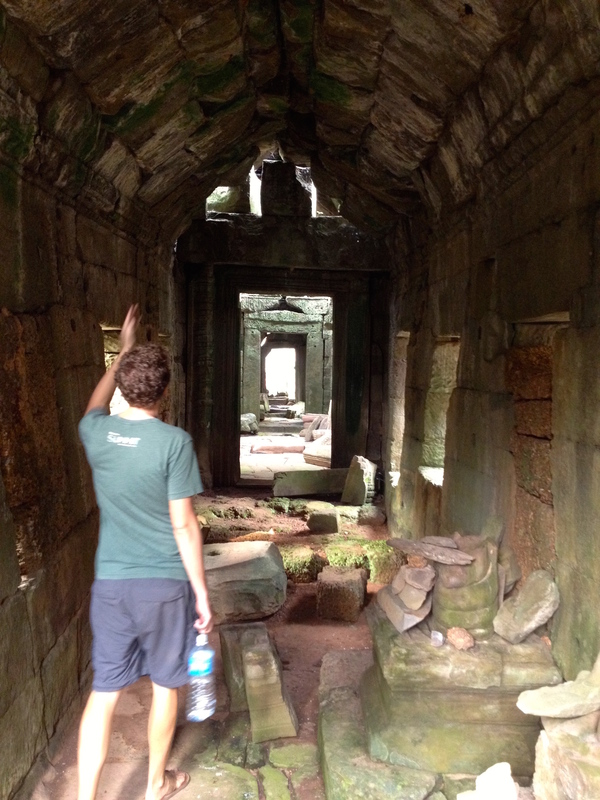 And here’s Kevin, busting down walls at Preah Khan. HULK SMASH. 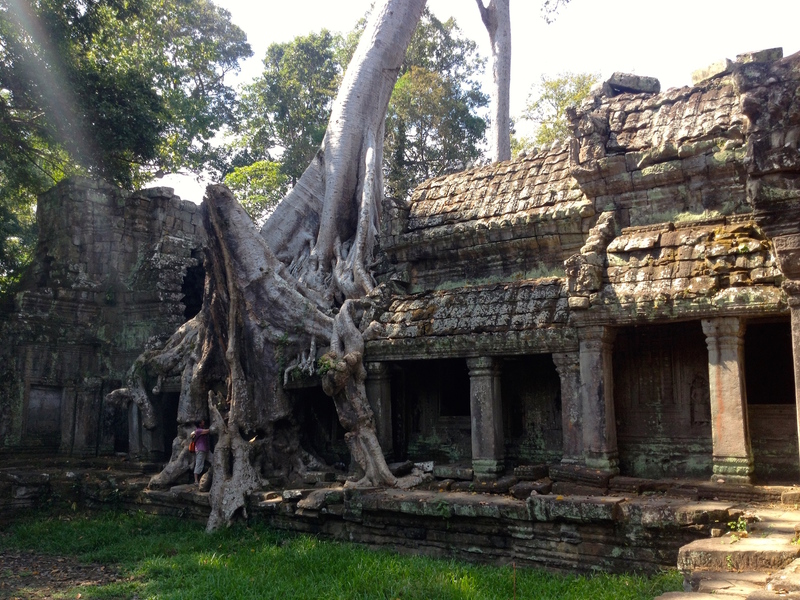 Preah Khan also has some hungry trees that decided to eat on its walls! 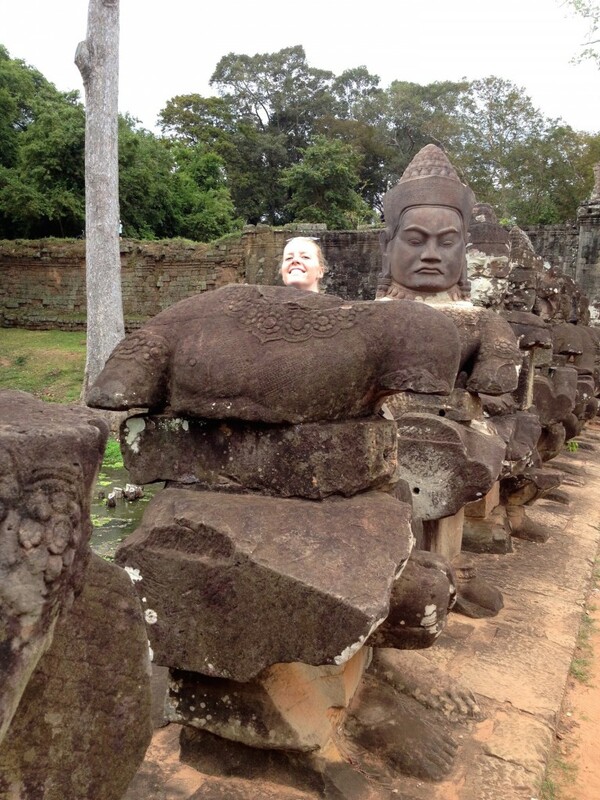 We liked to play a game called “pose like the carvings or statues.” Here I am, imitating the dancing ladies in the carving above me. NAILED IT. 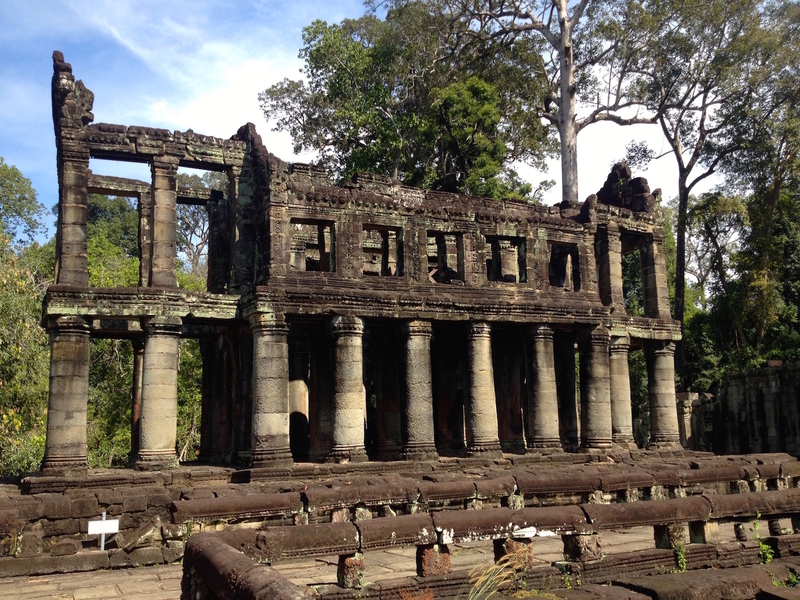 One of my favorite things about Preah Khan is the mysterious Grecian building on its Northern grounds. Does anyone know what it is, why it’s so different, or why it might even be there? Nope. What a fun mystery! 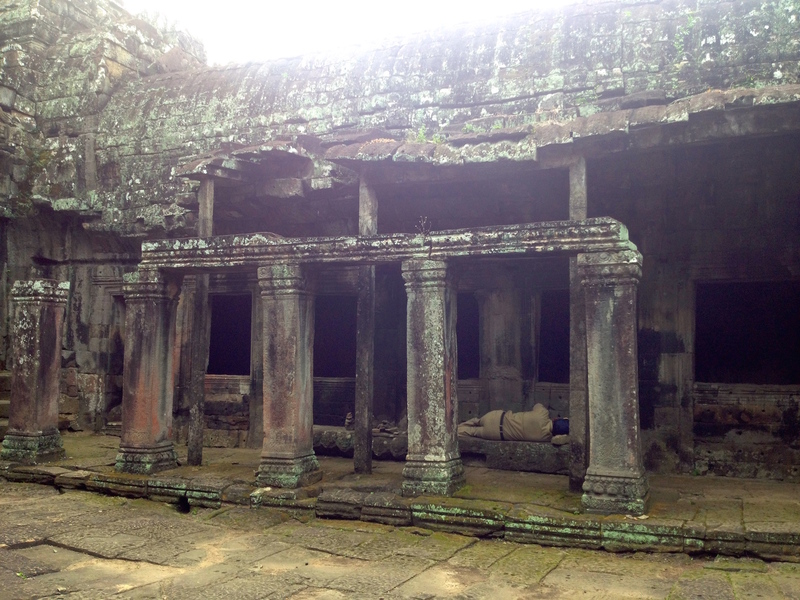 The mysterious Grecian-style building that is nothing like any of Preah Khan’s other structures! 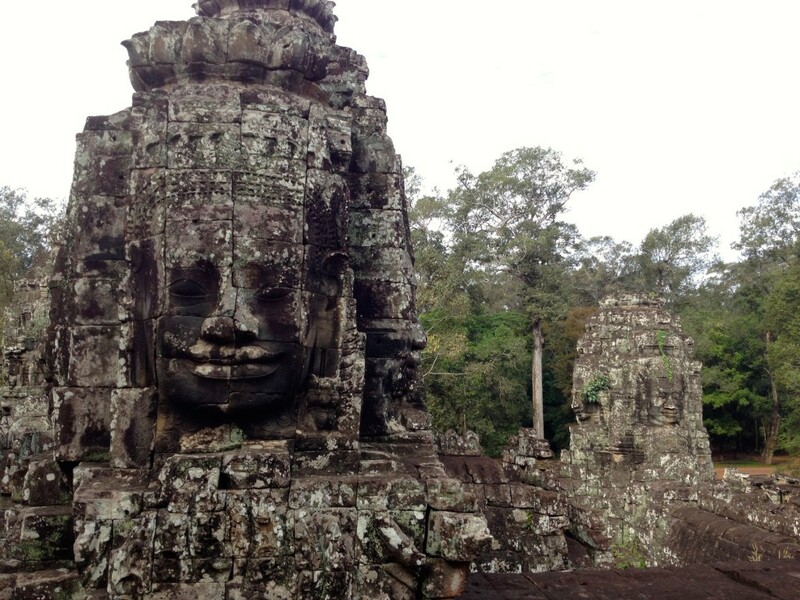 Bayon is probably the 2nd most popular temple behind Angkor Wat, and is completely overrun with crowds by 9am. In spite of the crowds, it’s still worth the visit. I think I would’ve loved this one if we arrived by 7am! 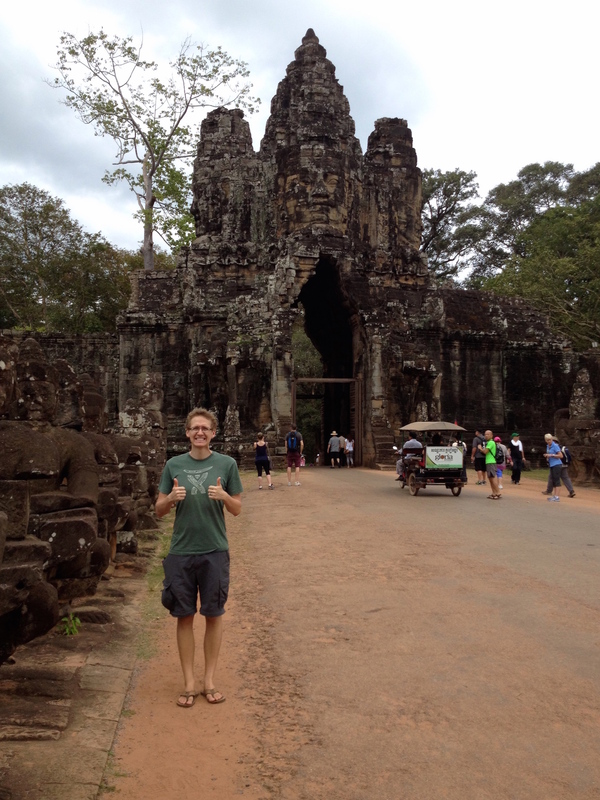 Hanging out at Bayon Temple. 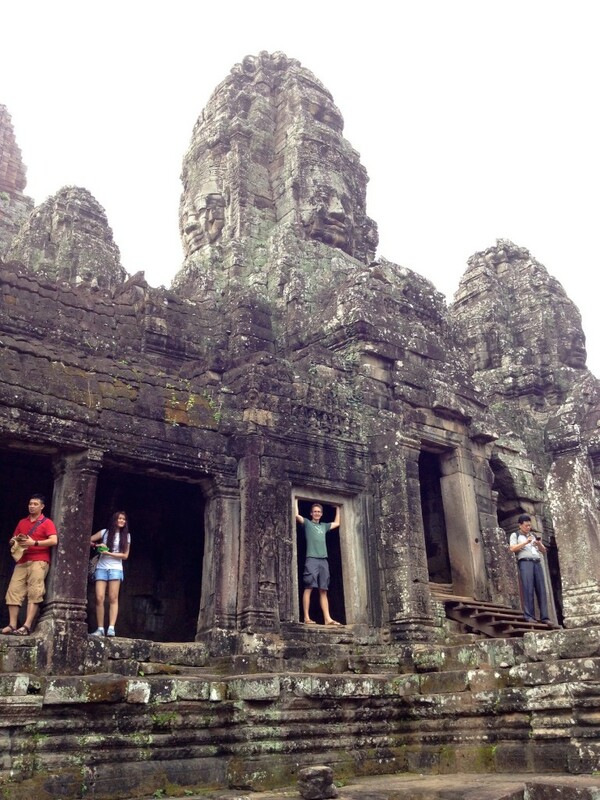 At Bayon Temple, you can climb to the top of the library in the Northeast corner to get a good view of it all. 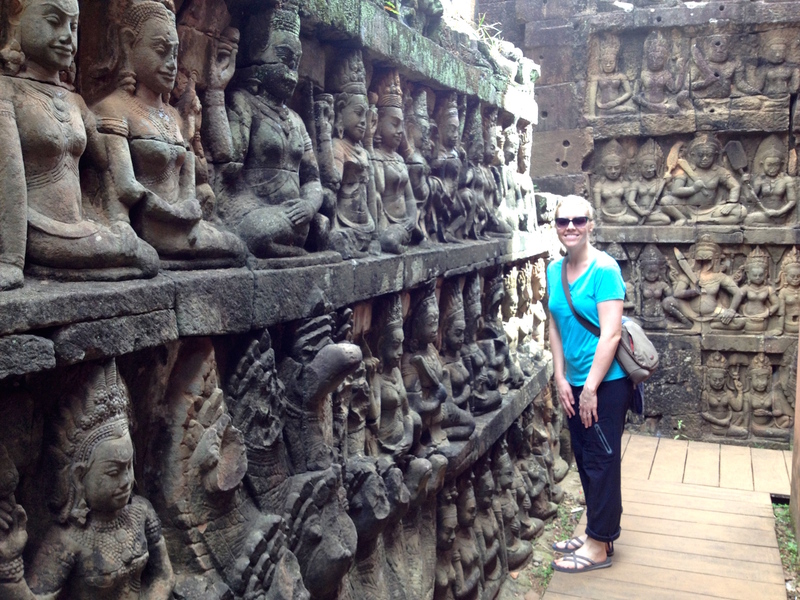 Bayon has some of the most intricate carvings we saw, and they all tell a story about history. 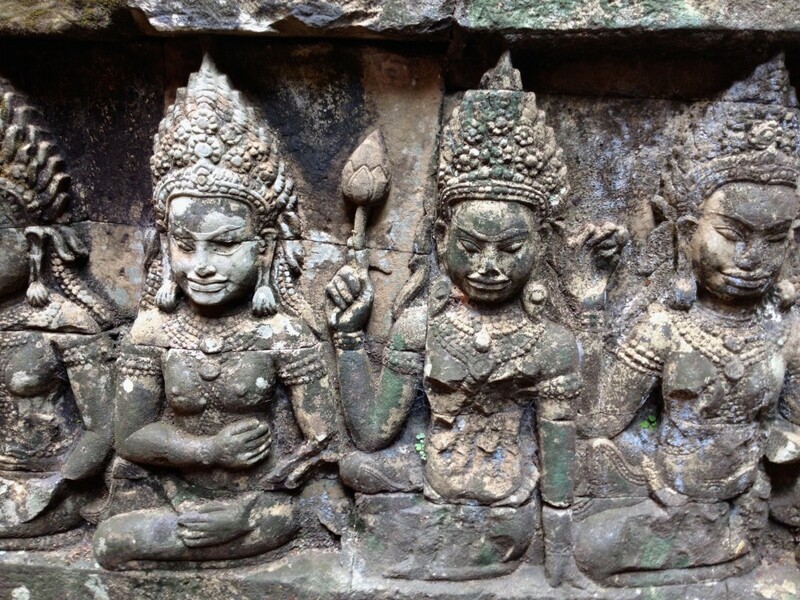 If you visit, grab a copy of Lonely Planet Cambodia for your Kindle so you can read all about the bas reliefs! Kevin and I have an annual holiday tradition of re-watching the Harry Potter series around Christmas time. I know what you’re thinking – it’s hard to believe we’re about to enter our 30s. I’m not sure how to explain our obsession, other than to say that there is almost ALWAYS a Christmas scene in each HP movie where someone says “Happy Christmas.” And I love that. All kid-movie references aside, Baphuon is pretty interesting. 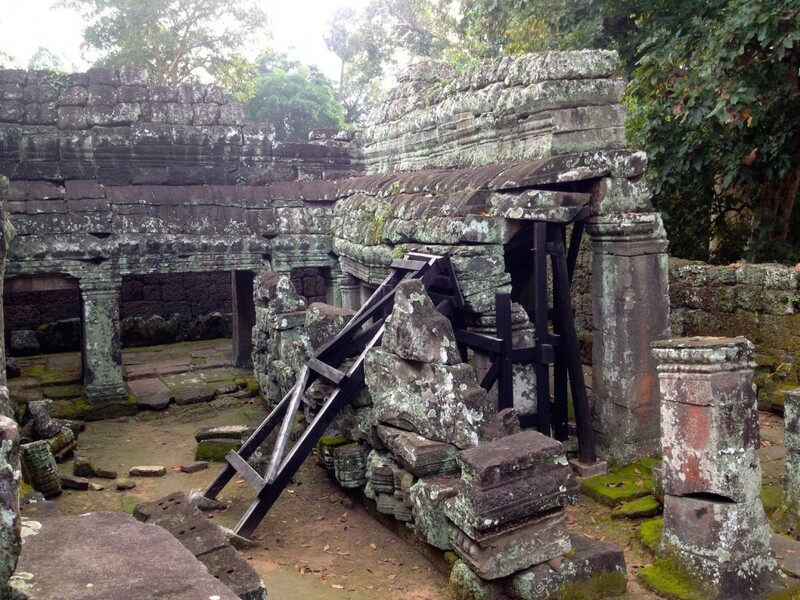 It was smack dab in the midst of restorations when the Cambodia Civil War began. 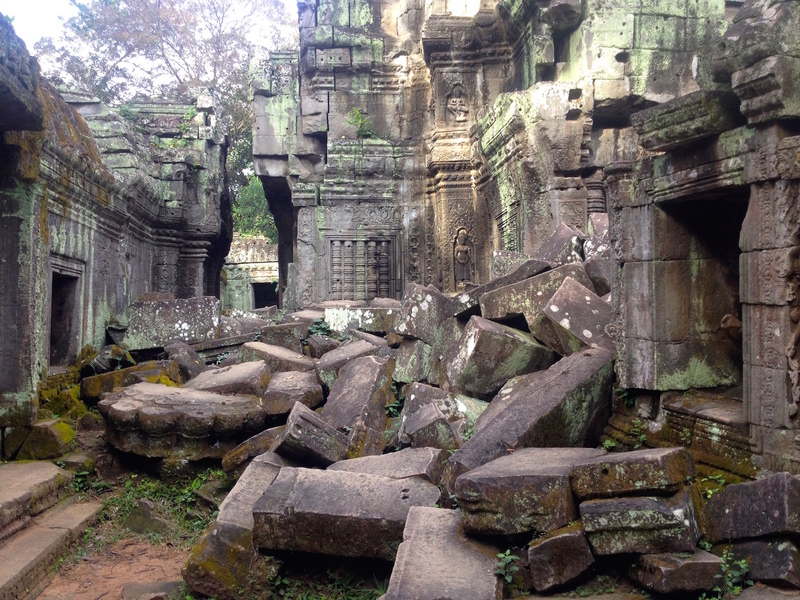 The temple was mostly disassembled when fighting began and the Khmer Rouge came to power, and all records of how the temple was supposed to be put back together were lost in the war. 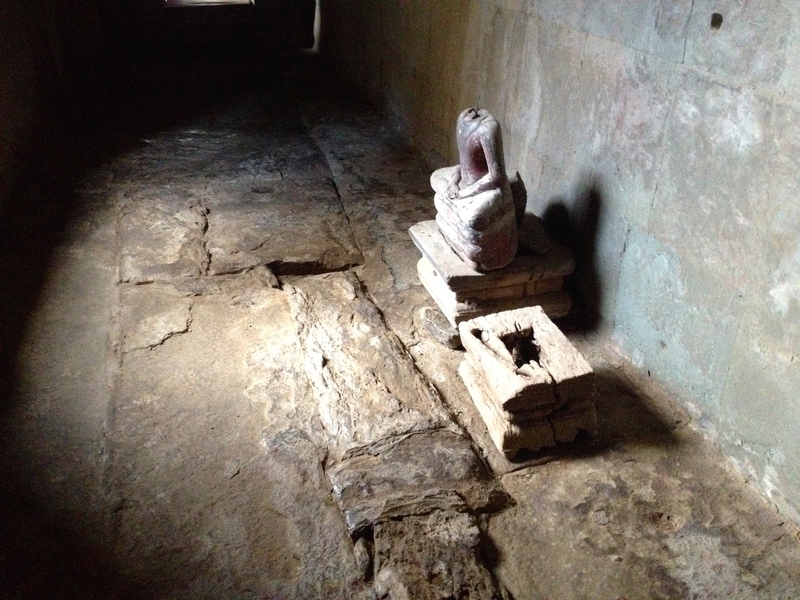 So when there was peace in Cambodia again, restoration teams were faced with a giant temple-sized puzzle that needed to put back together. I’m an amateur, but it looked like they did a good job to me! 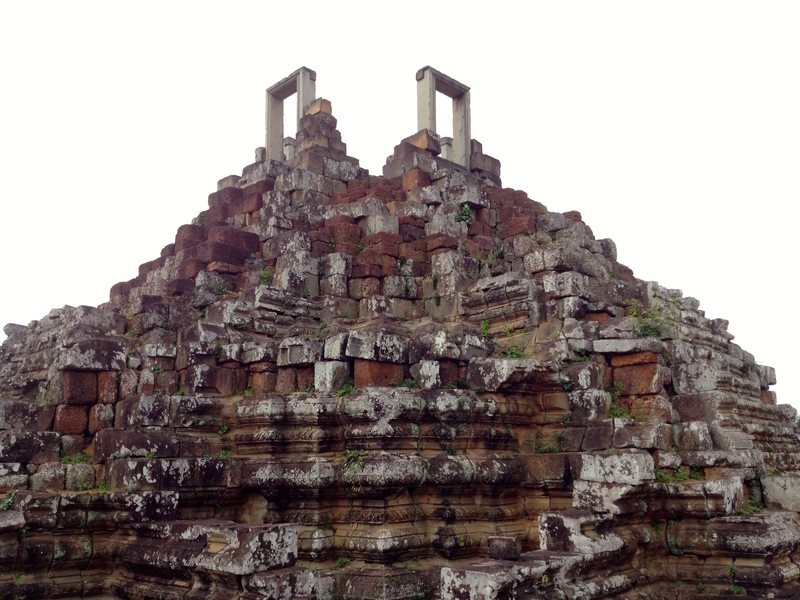 The view from the top of Baphuon. Lots of stairs! Go when it’s cool out! 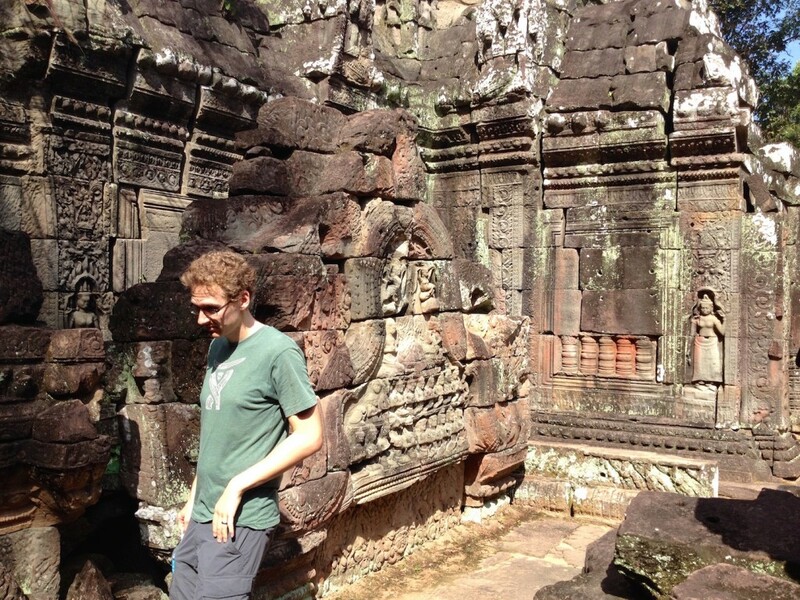 Angkor Thom is the “walled temple city” area which contains Bayon, Baphuon, and the Elephant and Leper Terraces. Each of its four sides has roads entering and leaving from one of its huge stone “gates”. 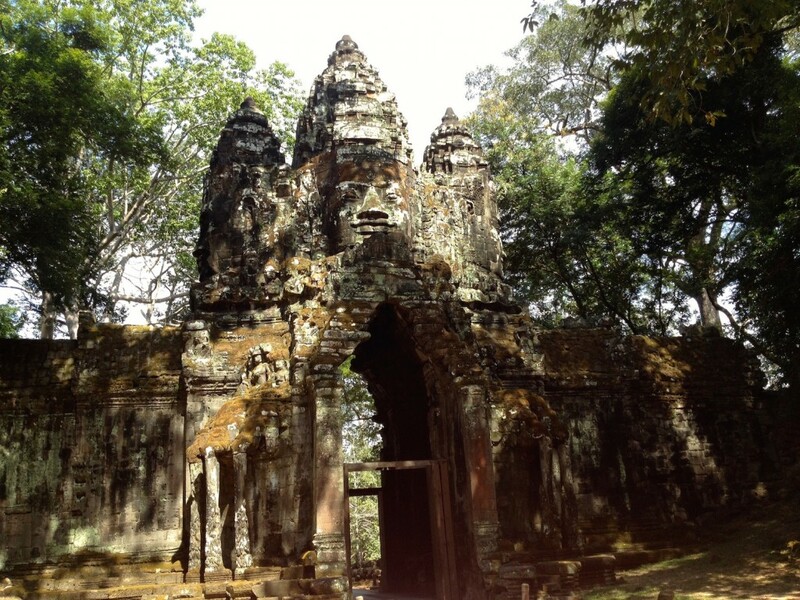 Angkor Thom’s North Gate. Check out the faces in the stone, so awesome! 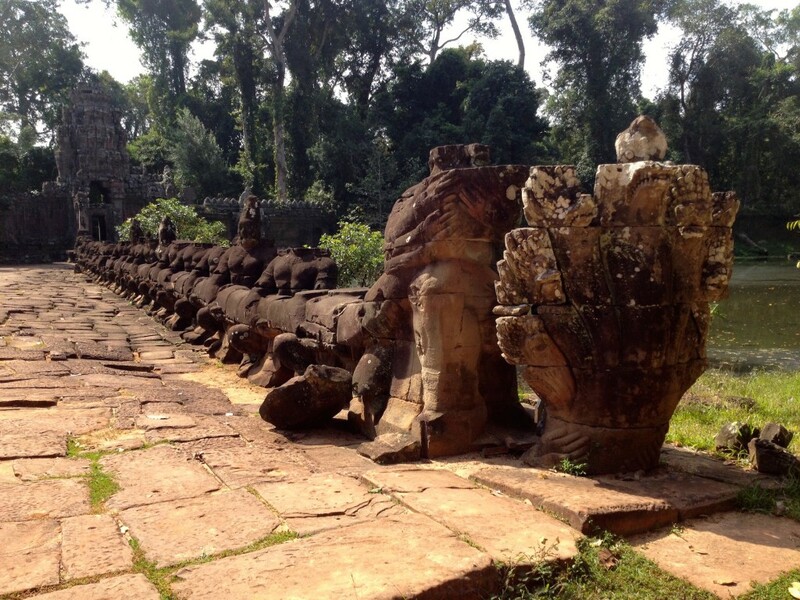 The Terrace of Elephants gets all the attention when it comes to Angkor Thom’s terraces. I didn’t think it was awesome enough to even warrant putting a photo into this blog post. But I really loved the Terrace of the Leper King! 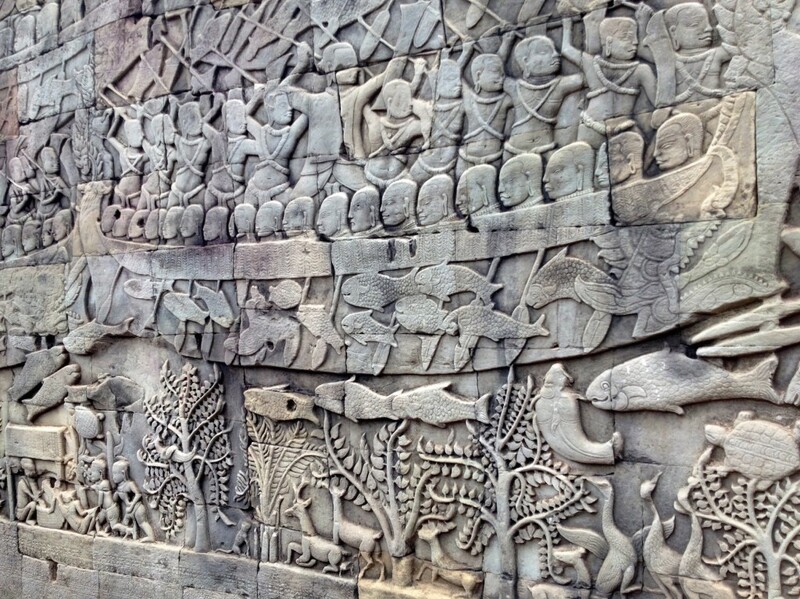 A false wall was put up in front of the original terrace wall, which means that the original carvings have been sheltered from wind and rain, and are in remarkably good shape. Terrace of the Leper King. 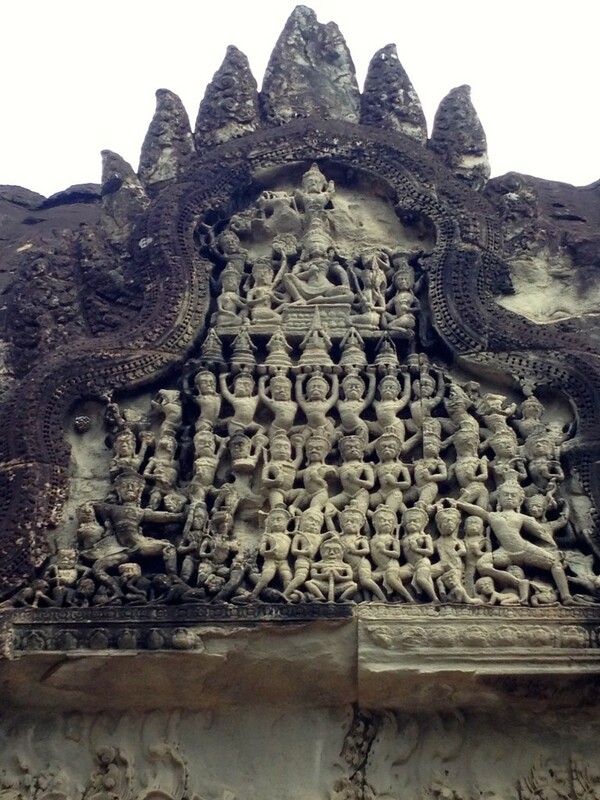 Aren’t these stone carvings incredible?! 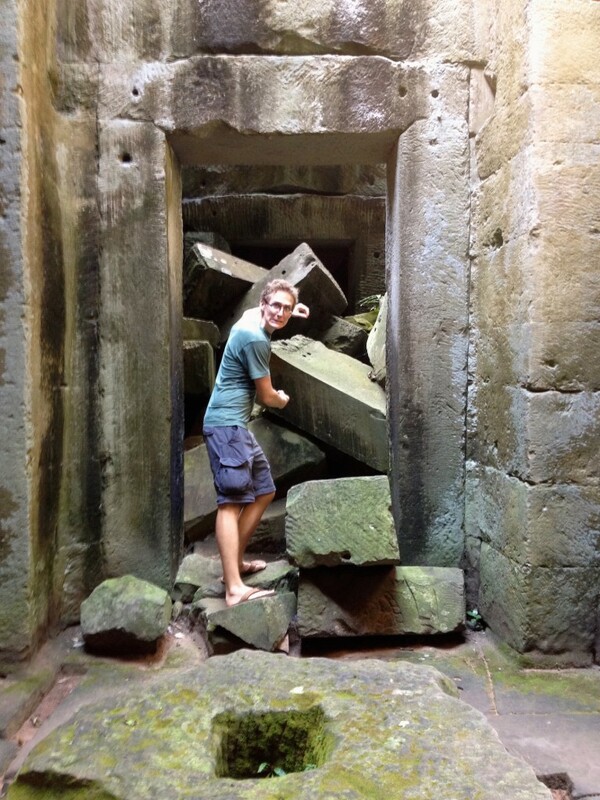 If you’re going to catch a sunset at Angkor Wat, Pre Rup is probably the best place to do it. We read on blog posts and heard from our Tuk Tuk driver that over a thousand people gather each night to watch the sunset from the hill temple Phnom Bakheng. At Pre Rup, the crowds are smaller and you watch the sun set over a more natural setting. The view isn’t as spectacular, the the lack of crowds probably makes up it. We didn’t get a very good sunset, though. BOO. Waiting for sunset at the top of Pre Rup. If you made it this far, you deserve a good laugh. We captured some photos that just make me chuckle – I hope they’ll make you laugh too. 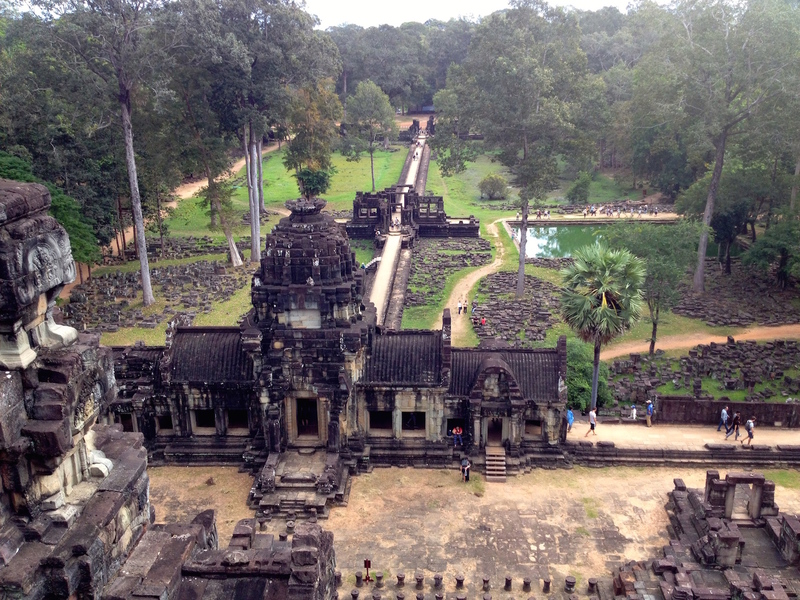 The view from the top of Angkor Wat. Someone is napping in this photo – can you find him? 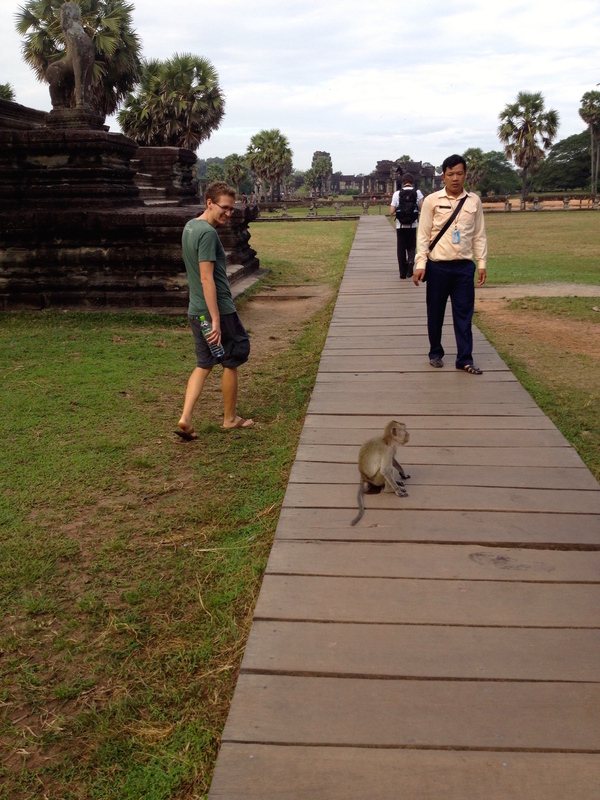 This monkey was hanging out in front of Angkor Wat and WOULD NOT move off of the boardwalk. Then he started peeing. Silly monkey! 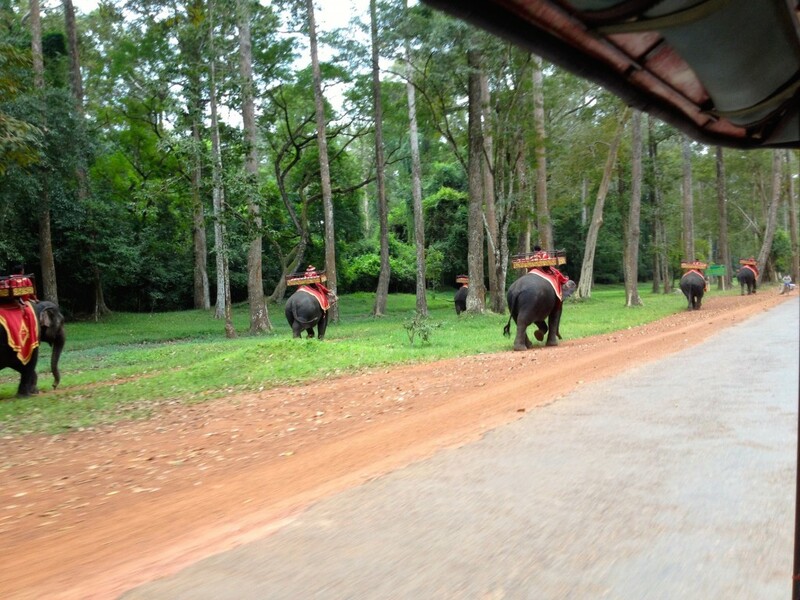 Elephants ROLL OUT. Snapped this photo of the massive elephant exodus for their lunch break. 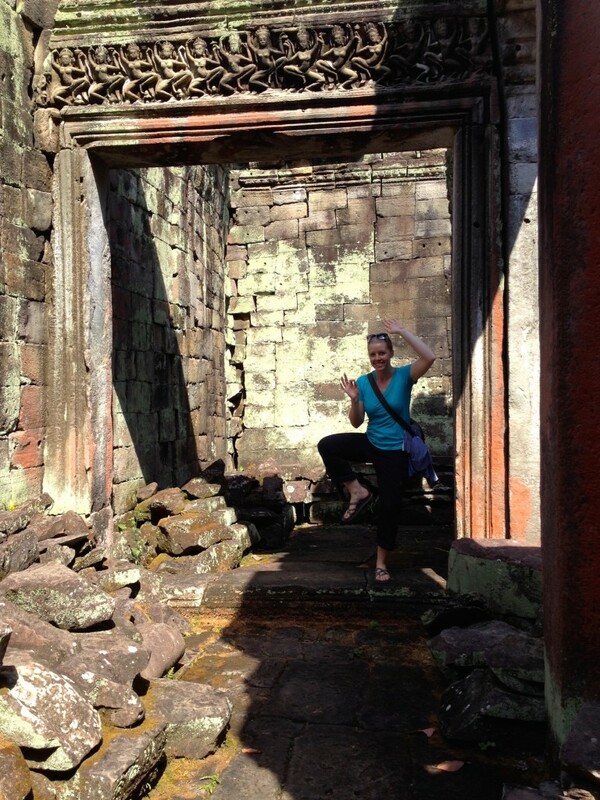 This is at Bayon. I’m not sure why, but there is a LOT of lipstick on this statue. I’m not sure if someone put it there on purpose, or if women wearing red lipstick kiss the statue. Either way, I chuckled. 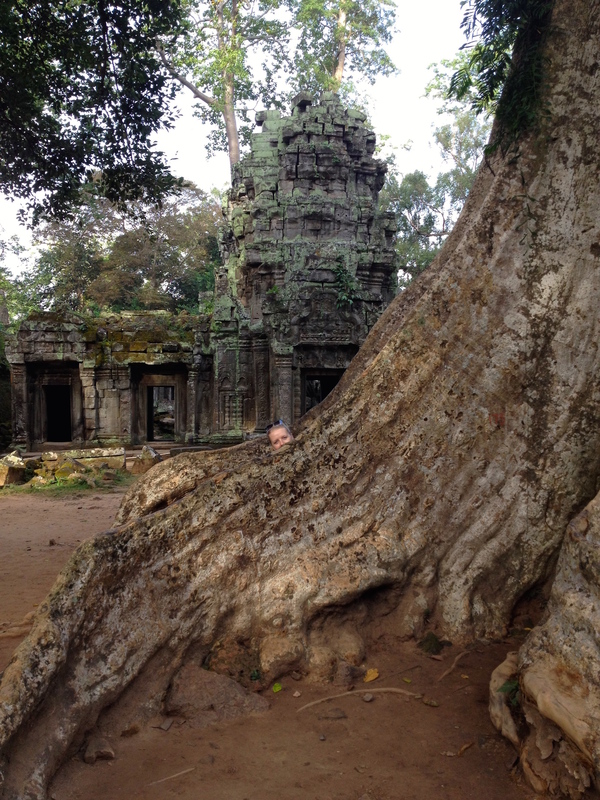 Can you find the tour guide sneaking in a nap in this photo? 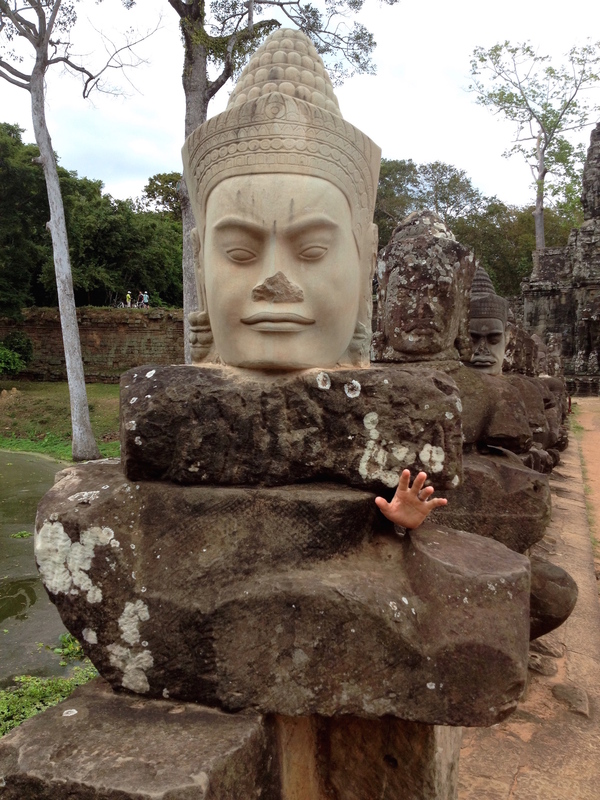 At the South Gate of Angkor Thom, some statues are missing their heads. Naturally, we made sure to replace it for our photo. Kevin is somewhere in this photo. Do you see him? What’s the most amazing religious site you’ve ever visited? 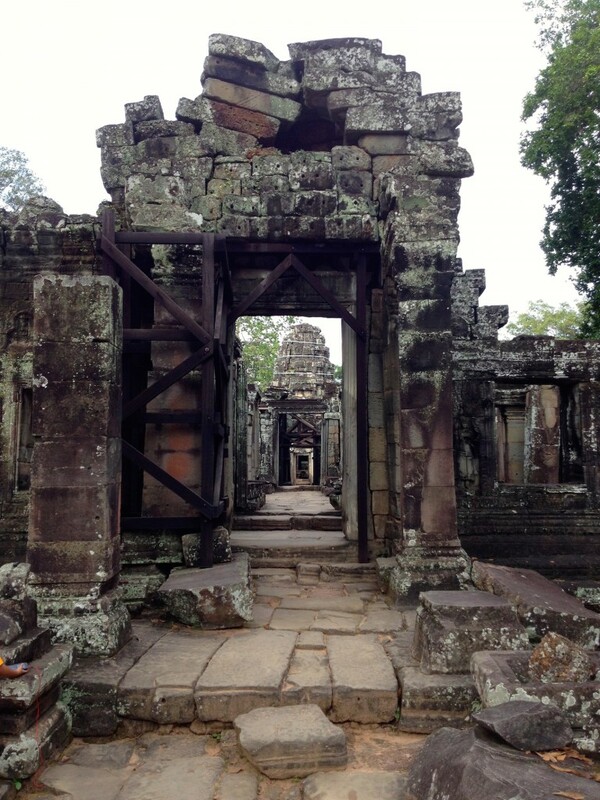 For us, Angkor Wat holds that torch now. We’d love any tips/suggestions on other places to travel, especially those located in Europe (we’re headed there next week!). I wish I had not 8 temples in ONE DAY…….. UGGHHHHHH. overtempleitis for sure. Haha EIGHT in a day?! Ooooooh I hope you had a pool to sit and relax next to later in the day. Mr. Kim! I am only just now reading your blog comment. I stopped looking at my blog after returning home to the US, but I’ve recently become interested in blogging again. 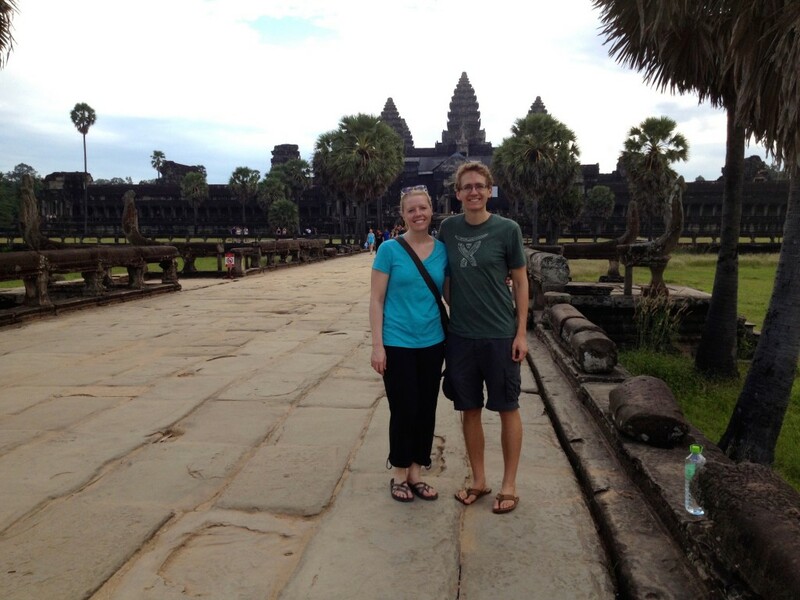 Kevin and I remember fondly our time visiting Angkor Wat – you were such a great driver and tour guide and we enjoyed touring the sights with you! We hope that you are well! We have a young daughter now named June who keeps us busy. Take care! Epic blog….this has been really helpful! I go in a week!!! Hi Lucinda! I hope you had a lovely trip. Thanks for reading. Cheers!